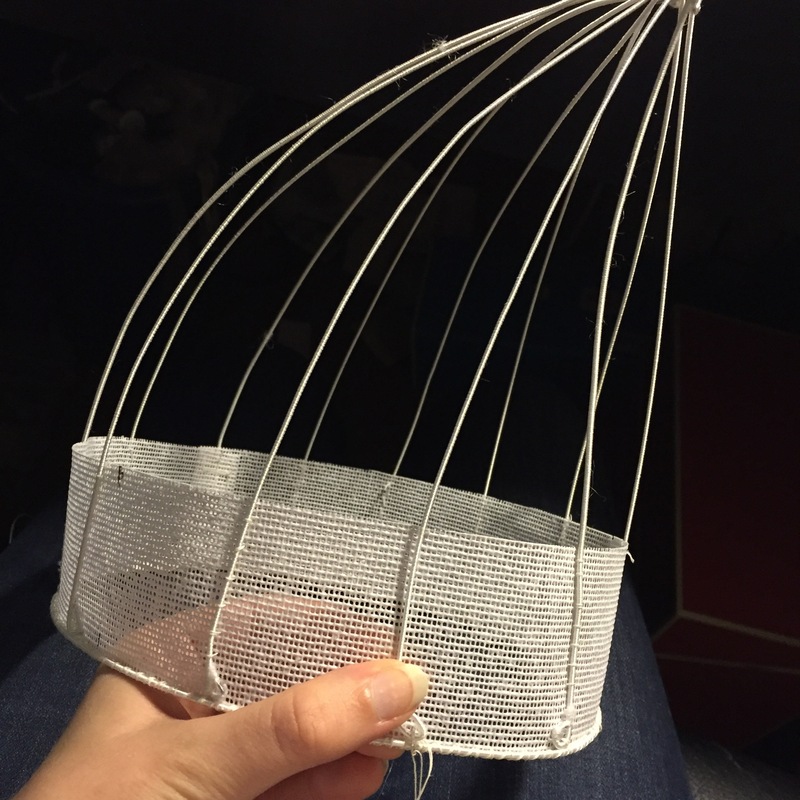 No…time…for…blogging (pant pant). Must…make…Christmas…presents (pant pant). As anyone who routinely makes handmade gifts knows, November is not a month in which one has spare time. This year is especially exciting because not only am I making many of my own gifts, but this spring my mother fulfilled her long-time dream of opening her own gallery, Somebody’s Gallery in Petoskey, MI. So I’m also working on items for sale there. It’s very nice when the economic cycle works out in my favor, and someone else’s holiday money can become my holiday money. That way, everybody’s happy! So I thought I’d give you a quick peek at some of the items I’ve been working on: recycled sari-silk wallets. I was searching for saris on eBay months ago, and found a seller who just sells scraps of old saris and sari trims. I bought up several lots of pieces about a foot wide and the sari’s width long and started covering pillows with the fabric. There was always a bit leftover at the end and around the edges that wasn’t large enough for pillows, and it seemed silly to waste all that lovely fabric, so I decided to start making wallets. 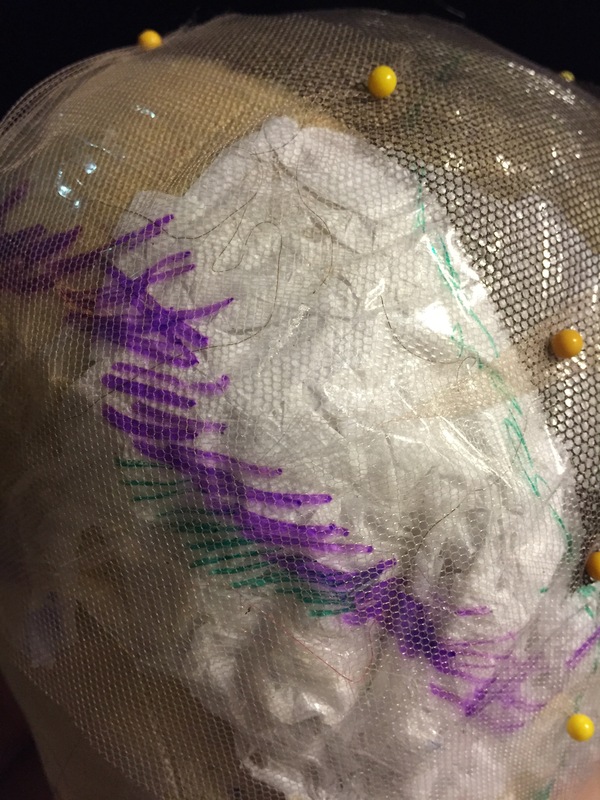 Since the silks are very thin, I started with canvas from the remnants bin at Joann. I marked out all the pieces on it to save as much space as possible, and cut them out. 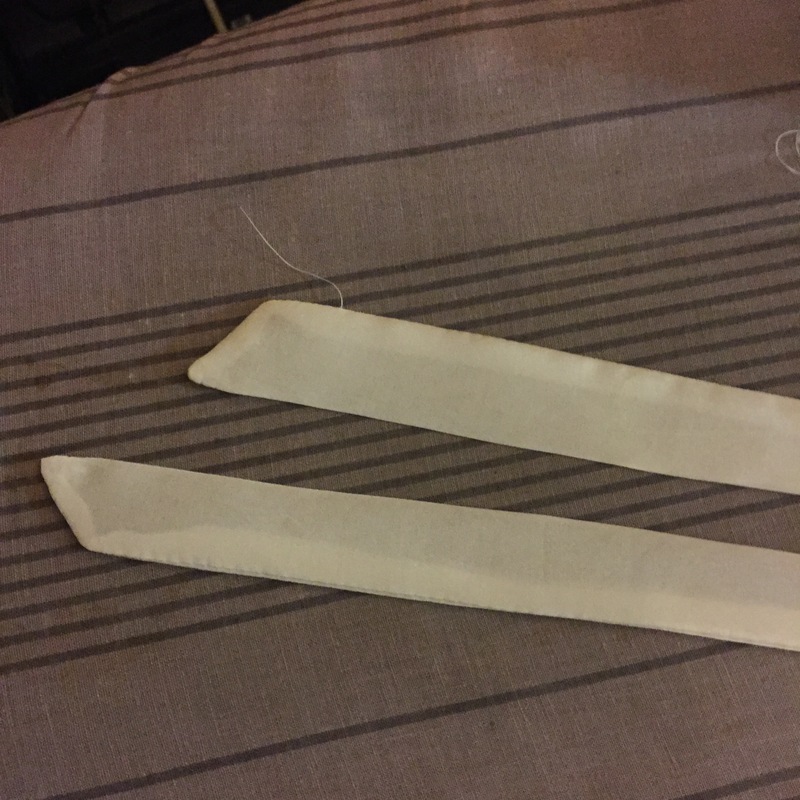 I then starched them so they were nice and stiff. 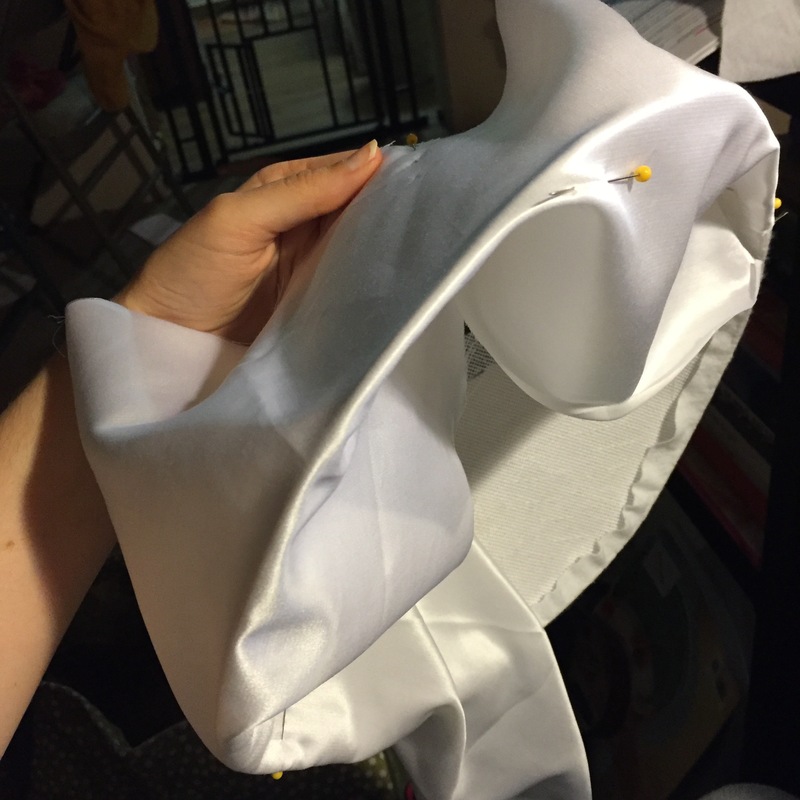 I used the canvas pieces themselves as templates and cut out the silk with a rotary cutter. The wallets each have four larger pockets and eight card pockets. It took me several tries to figure out exactly how much larger the silk pieces should be than the canvas in order to finish them properly. 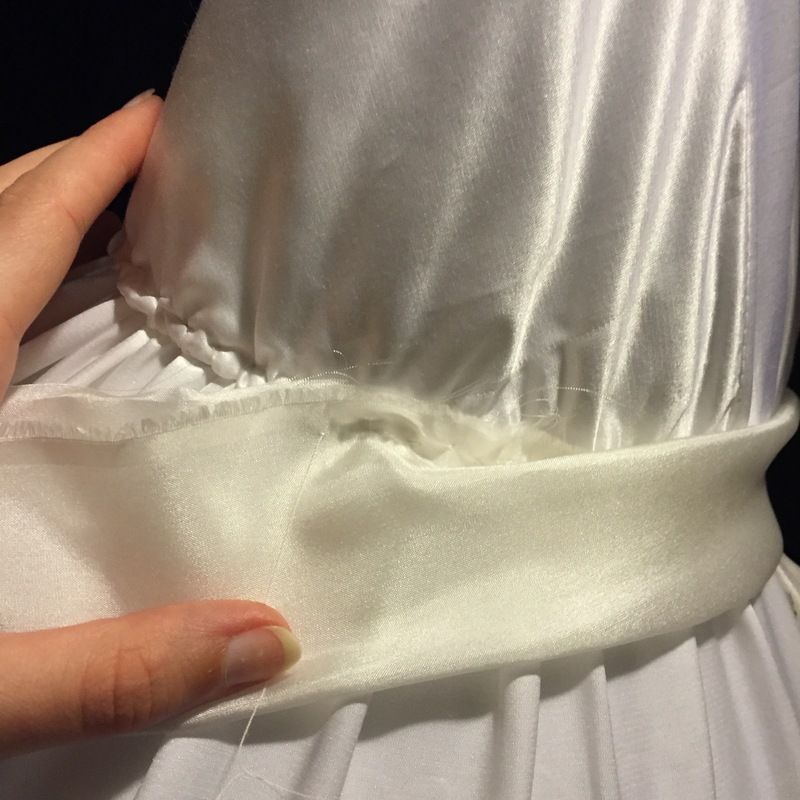 On the larger pockets, the silk needs to double over so that it covers them on the inside as well, that way there’s no blank canvas. The card pockets don’t open enough for that to be a problem. 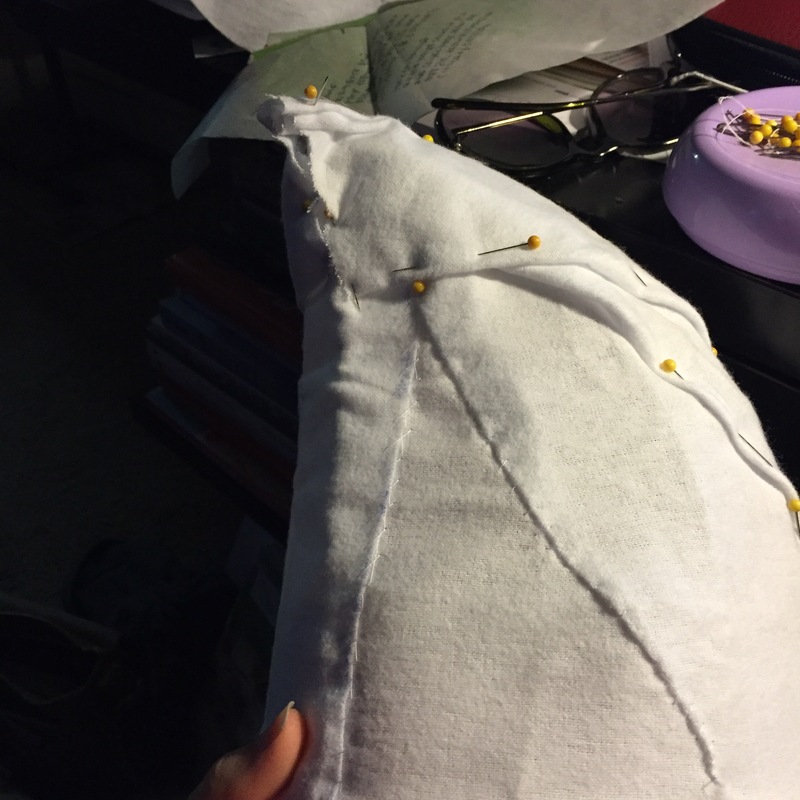 There is a very careful order of operations that goes into making one of these things so that the backs of the seams don’t show anywhere. It took me several wallets to get things just right. I took these pictures while making the first wallet, and I’ve made some serious changes to how they go together since then, but you get the basic idea. Testing out the first card pocket. I had to figure out a different way of doing this part after the first wallet because this way, the raw edges from the card pockets were visible in the bottom of the big pocket they’re attached to. Now I finish each card pocket individually along the edge of the larger pocket. Yes, I did forget one of the larger pockets on this one. Oh well, it was my first try. 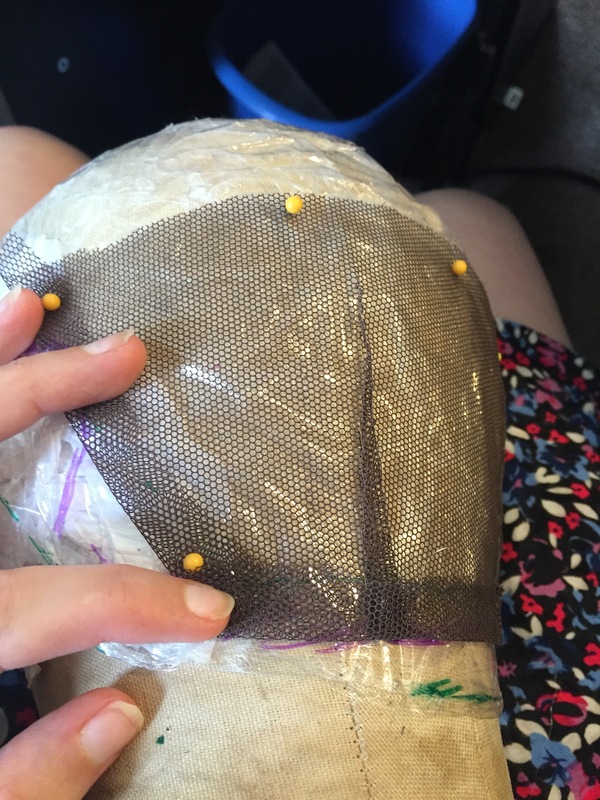 The outer piece has to go on last so that it covers up all of the other work you’ve done! 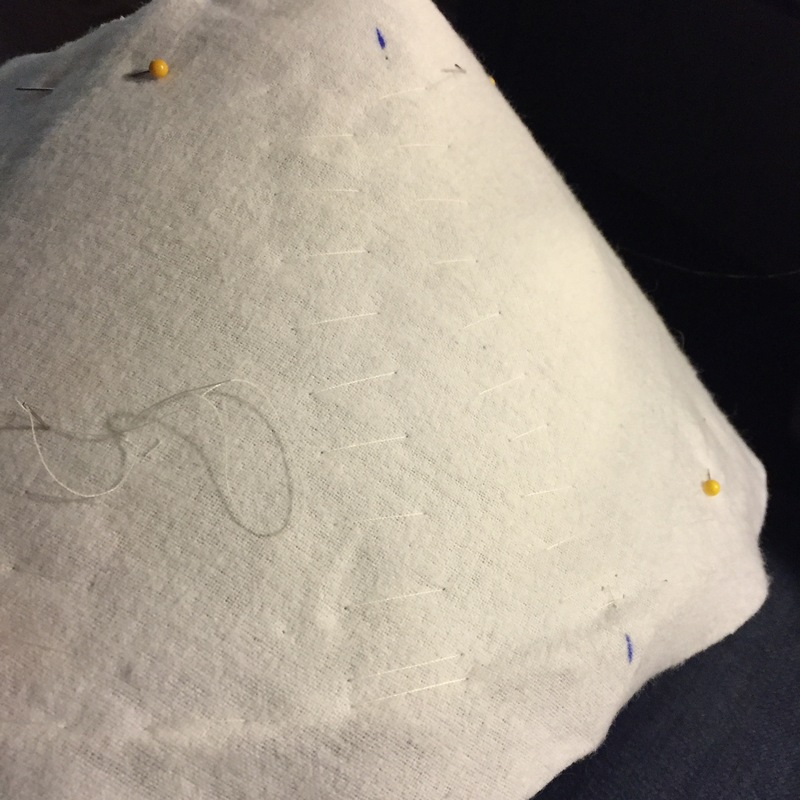 I like having the line of contrast stitching around the edge, though. Then it’s just a matter of using the outer piece to cover up the raw edges, and attaching snaps. 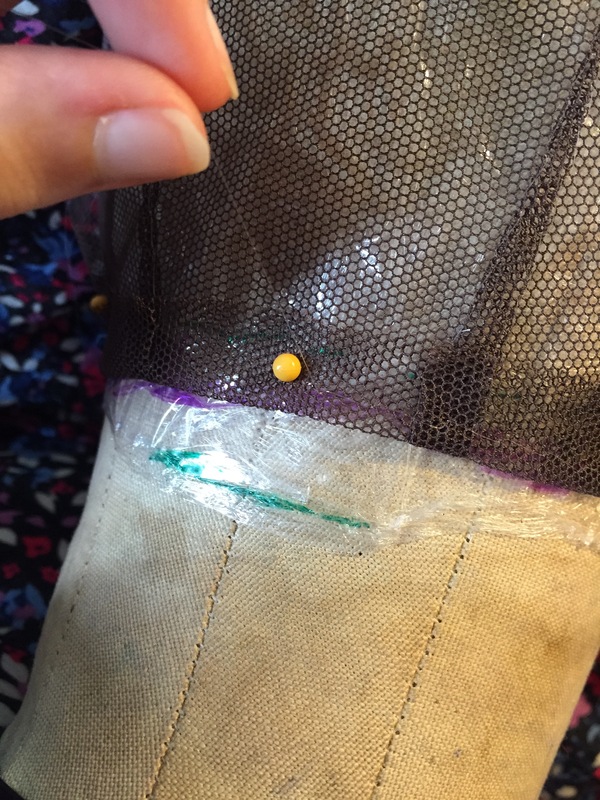 I covered the places where the snaps attach on the outside with mother-of-pearl buttons. Here’s the wallet before the fasteners went on. And here are the insides of all four of the ones I’ve made so far, so you can see all of the beautiful fabrics. Now, I’d better get back to work! 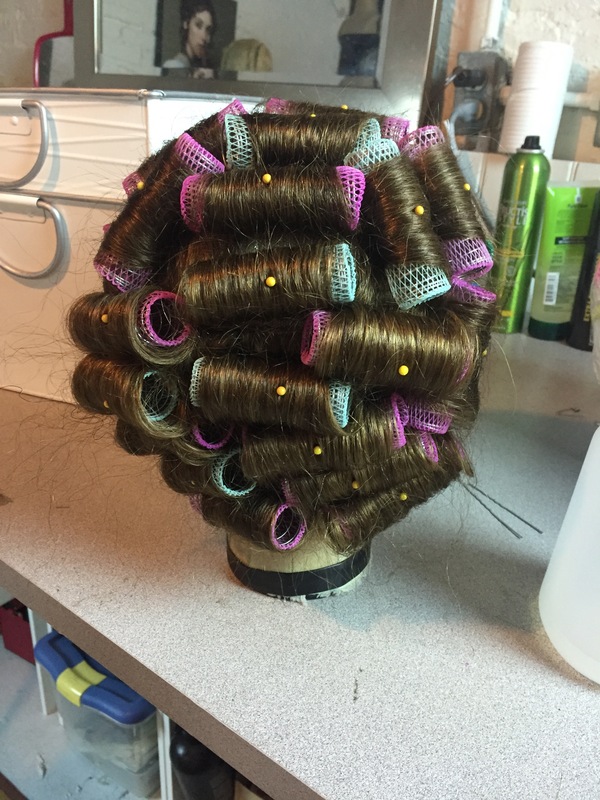 There are many kinds of wigs, but the kind I make are custom fitted and hand-tied–the same kind that are used in films, television, and on Broadway. 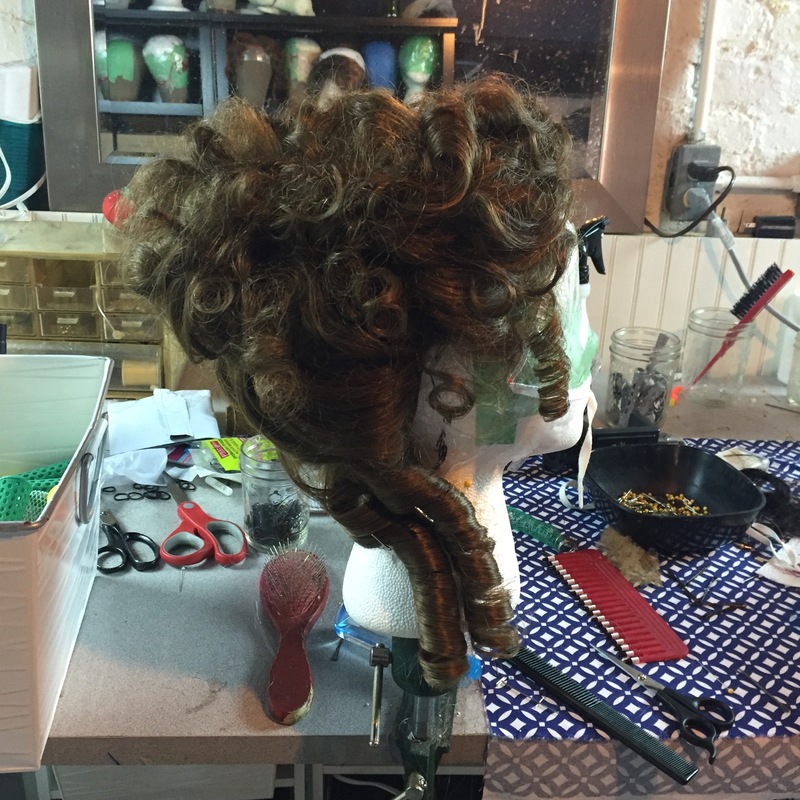 If you’d like to see more examples (or explore getting one of these babies for yourself), check out Custom Wig Company‘s website. I linked right to our client gallery, but there are even more pictures if you hop around to different sections of the site. 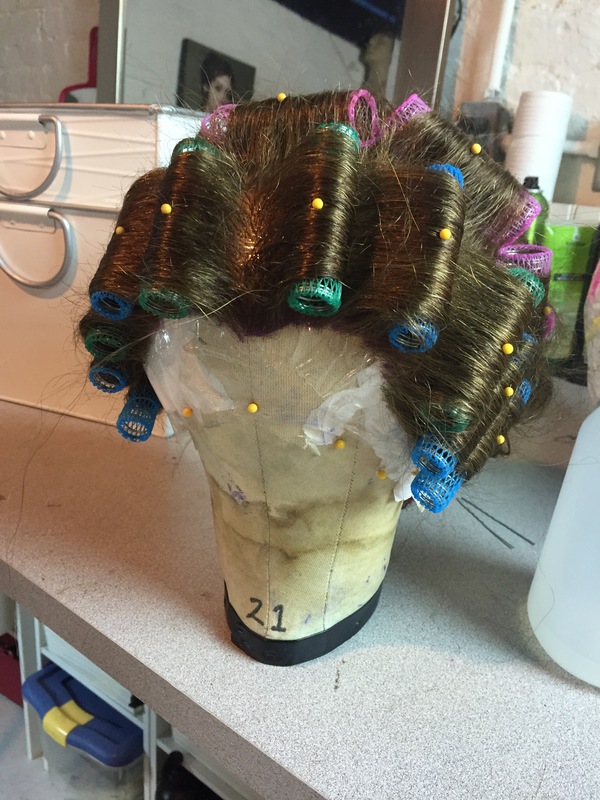 I took the pictures in this blog back in July, when I was making my own historical wig. 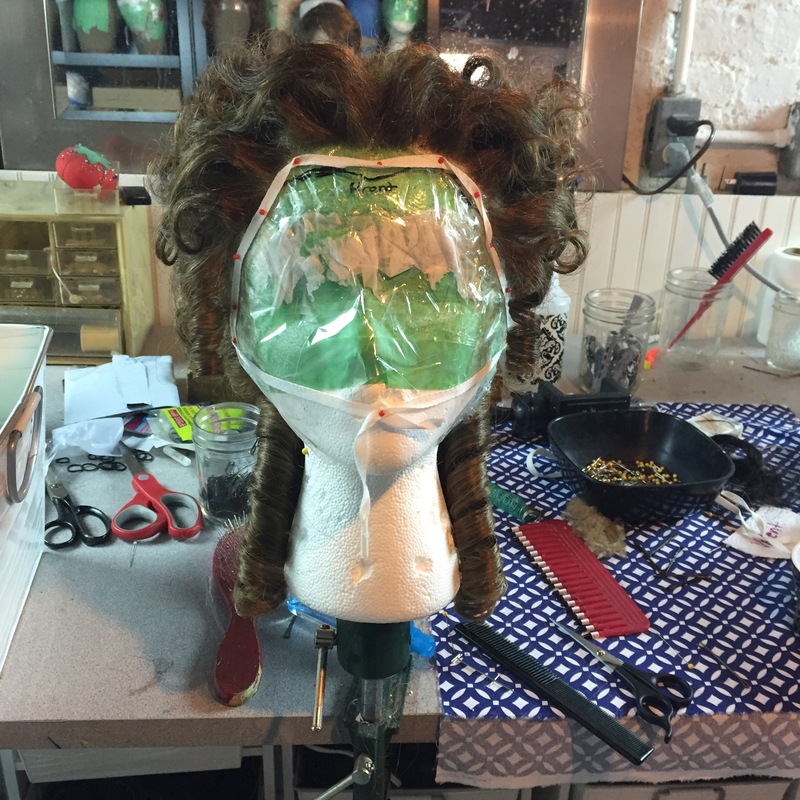 We always say the invention of Saran wrap is the greatest leap-forward in wig-making technology in a century. 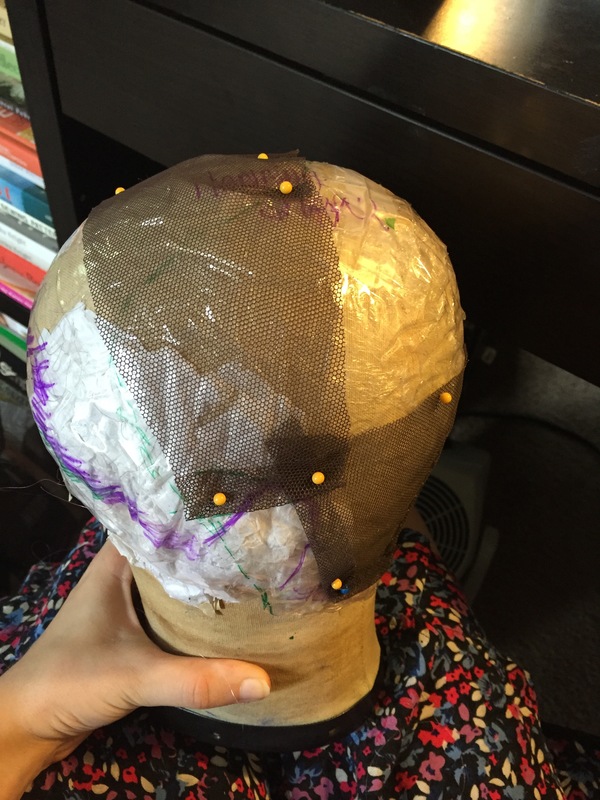 The first step to any custom wig is, of course, a good fit. 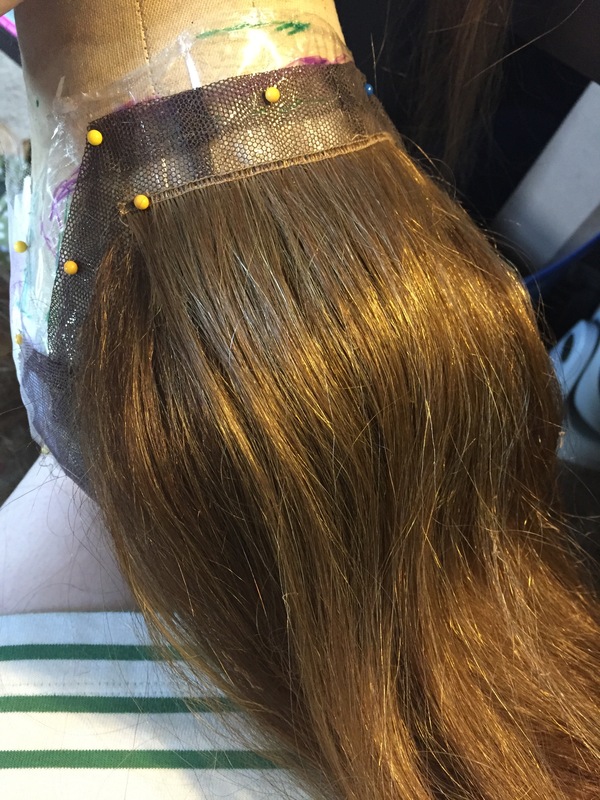 This ensures that the wig is comfortable, doesn’t constrict, and will want to stay on the head with minimal pinning and gluing. 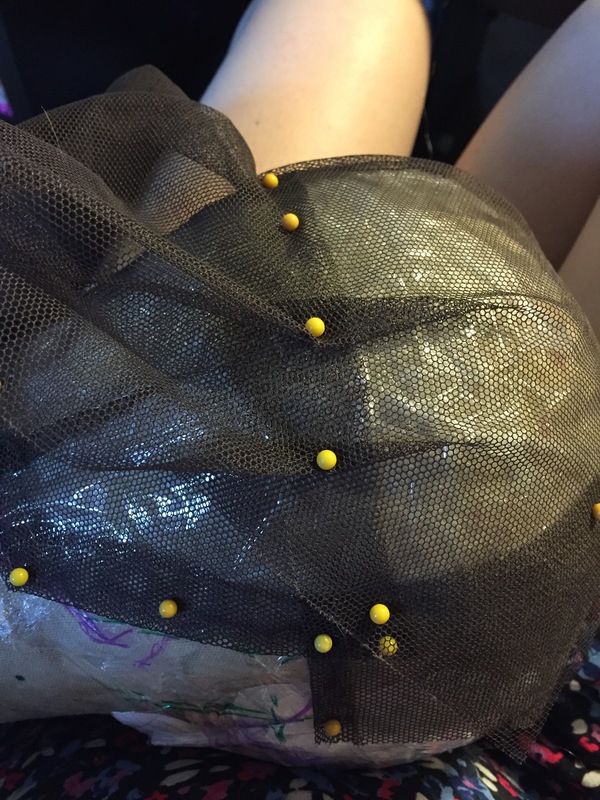 To get a good fit, we take (or clients take themselves) a head wrap by covering the head (only the hair part, of course!) 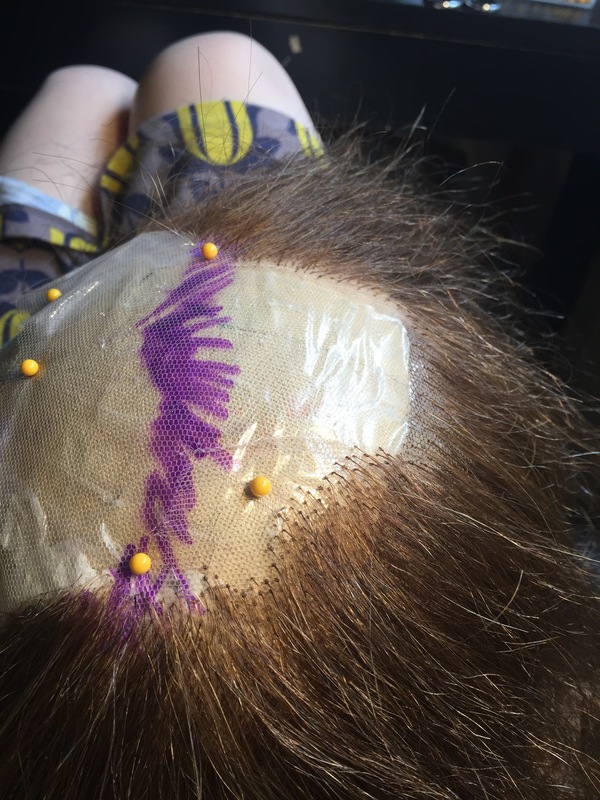 in Saran wrap, and taping it down with clear tape and drawing on the hairline in Sharpie. 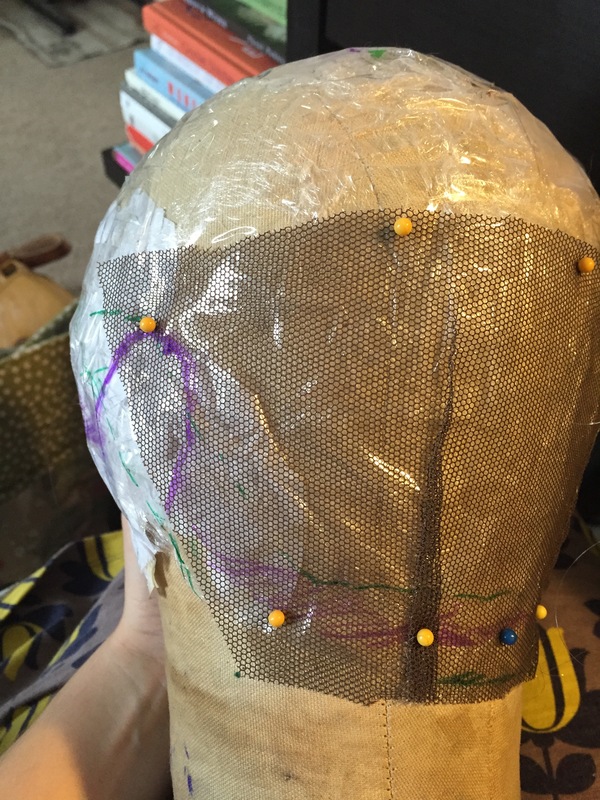 The tape means that the Saran wrap will hold the form of the head once it is removed. 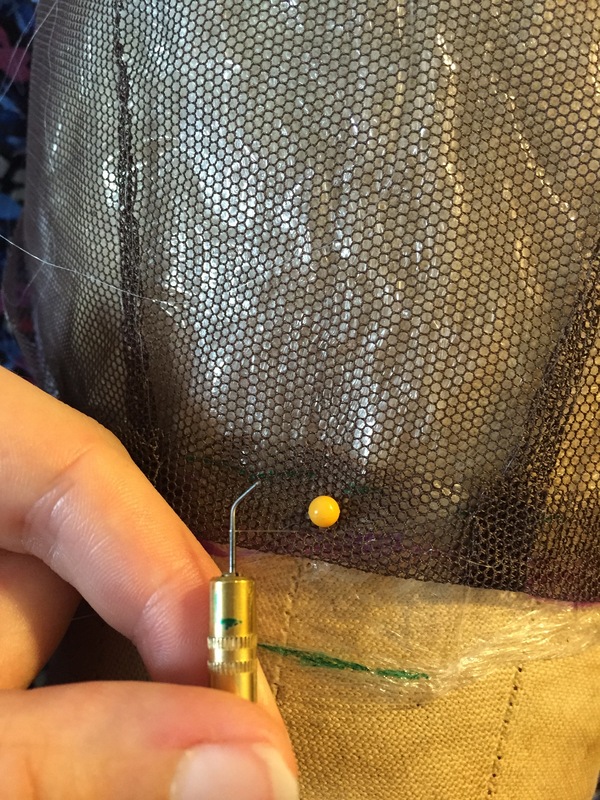 This allows us to get not only the measurements of the head, but the shape, which is much more important for a good fit. 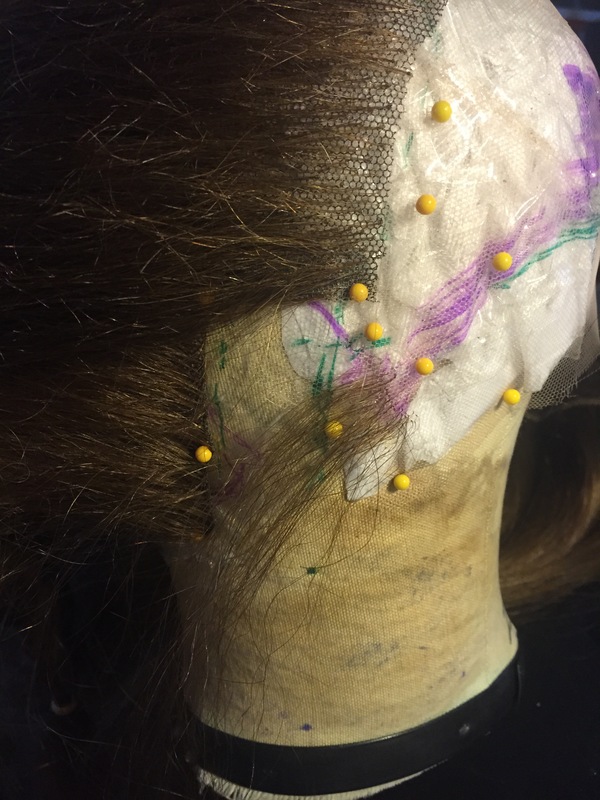 It also allows us to follow a clients hairline exactly, which will help the piece look more natural on them. 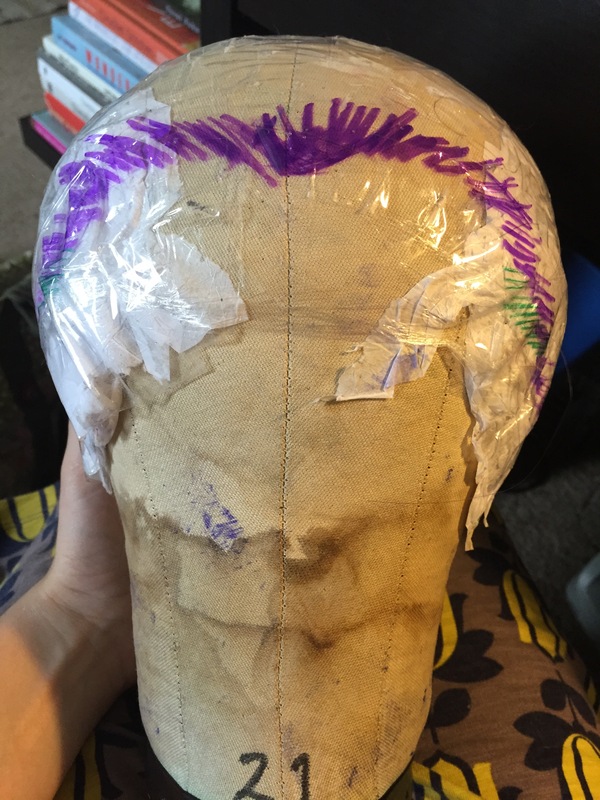 We can easily modify the hairline to add a widow’s peak, or bring up a receding hairline if desired. 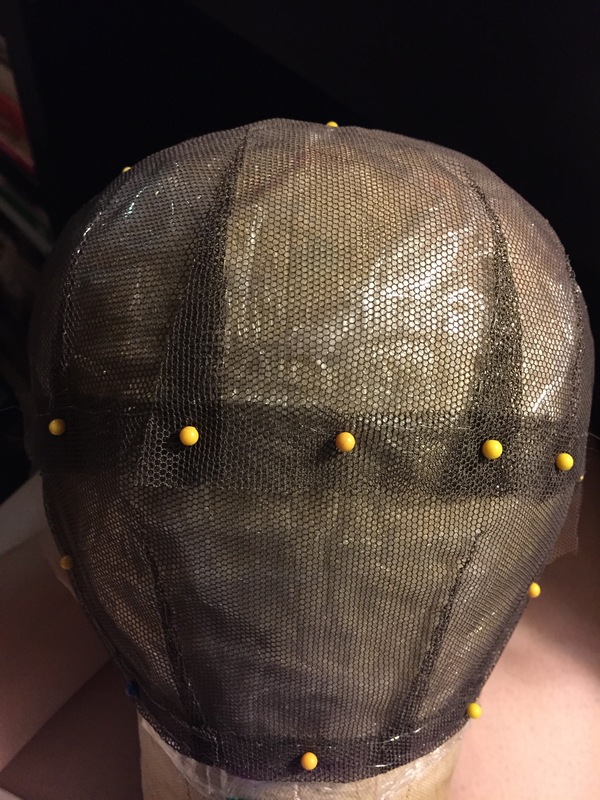 We then find a canvas head block that fits the wrap as closely as possible and pin the wrap to it, padding out any areas that don’t quite fit with tissue paper until we have a block the exact shape of the client’s head. 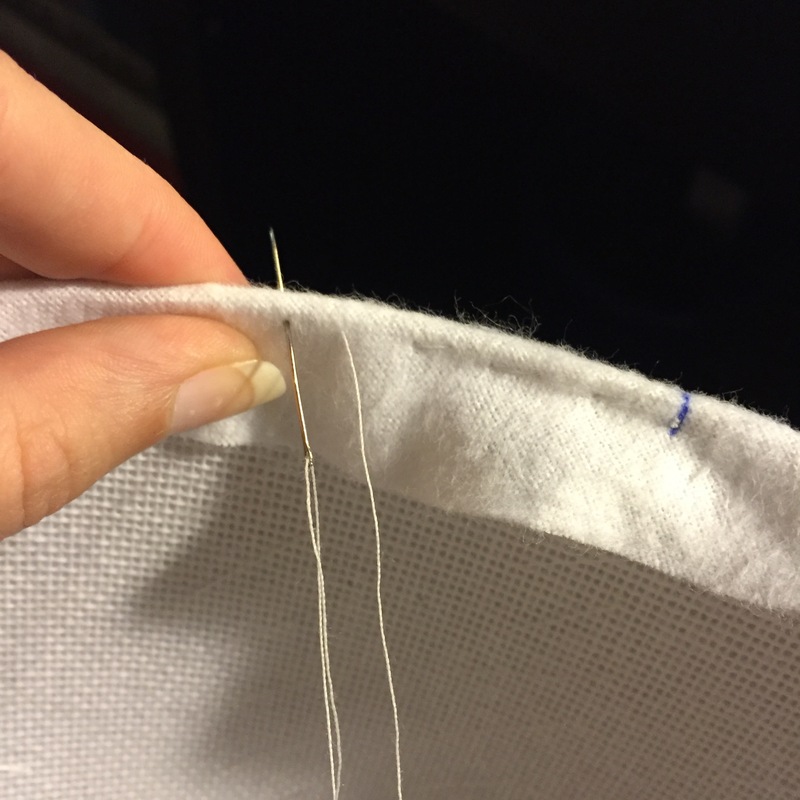 I generally sew around this piece and up and down the darts in one seam that ends up looking like the feed on a heart monitor. 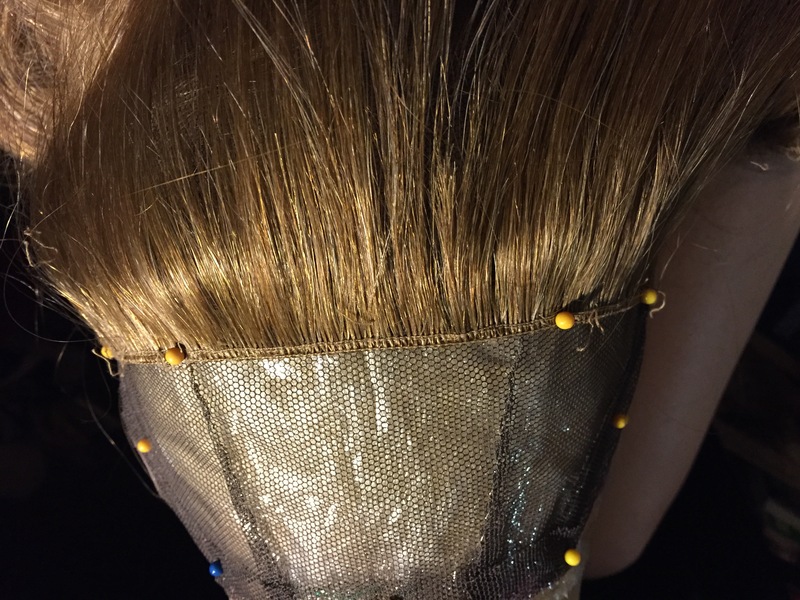 The lace is the final piece of the puzzle. 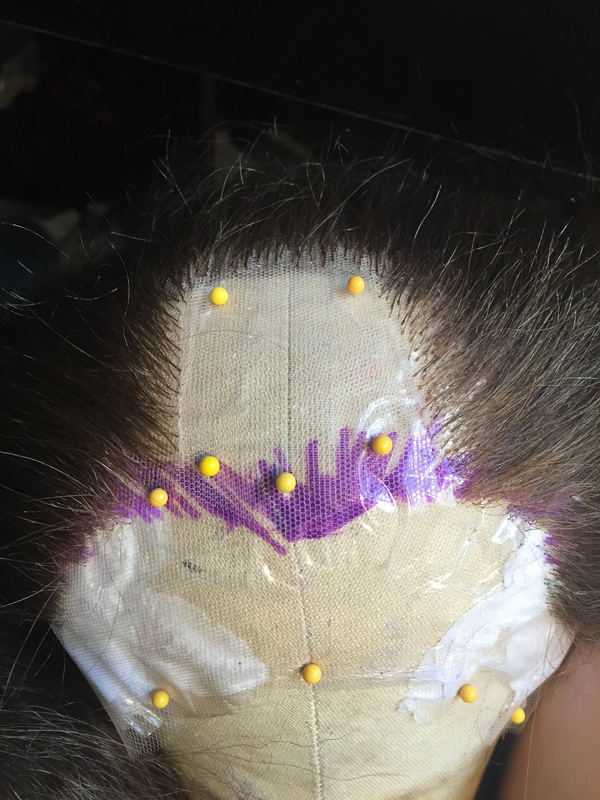 It gets placed very carefully across the forehead, just below the hairline so that it will lie as flat as possible against the skin. 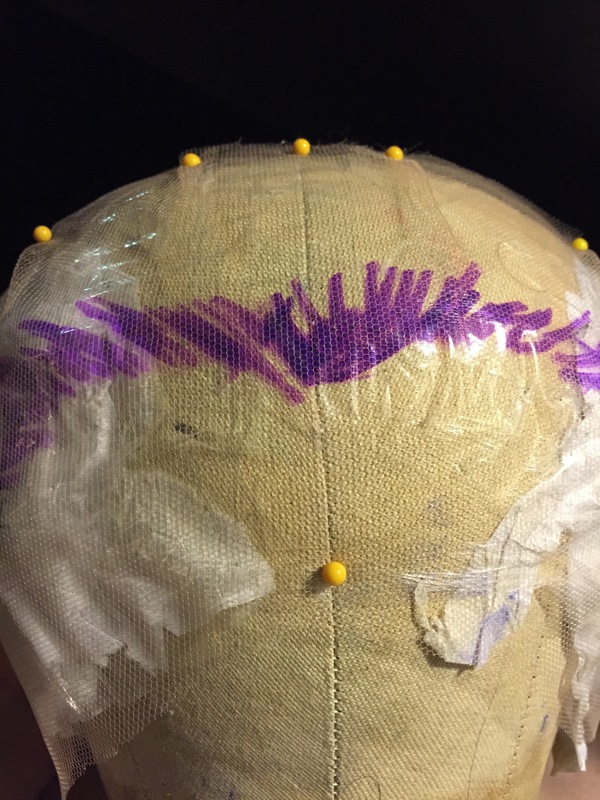 From there, I took darts in at the seam between lace and veg net, being very careful to make sure they didn’t extend beyond the hairline. 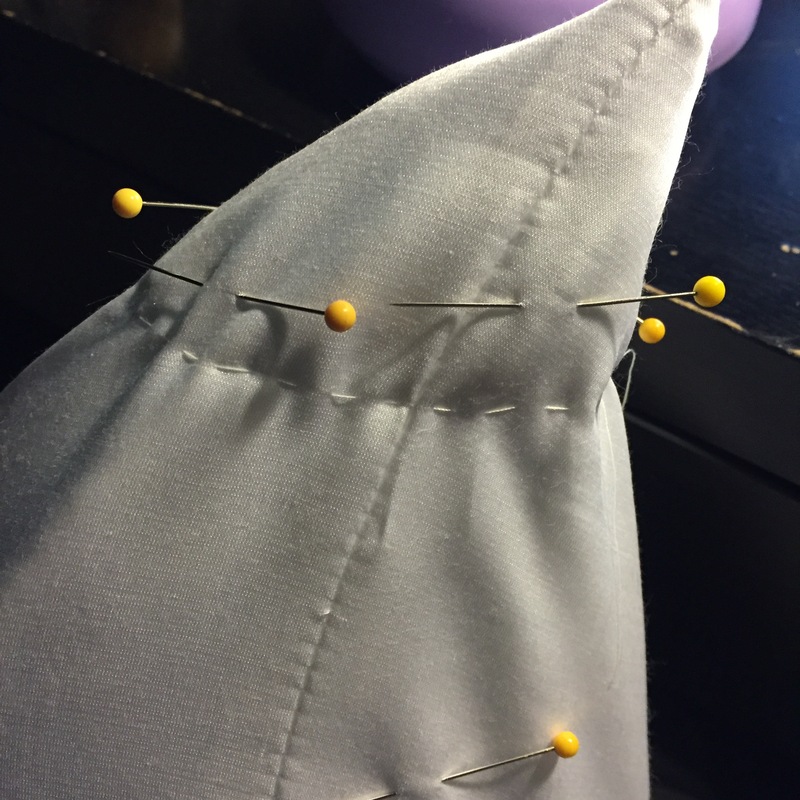 This gets sewn the same way as the rest of the foundation. 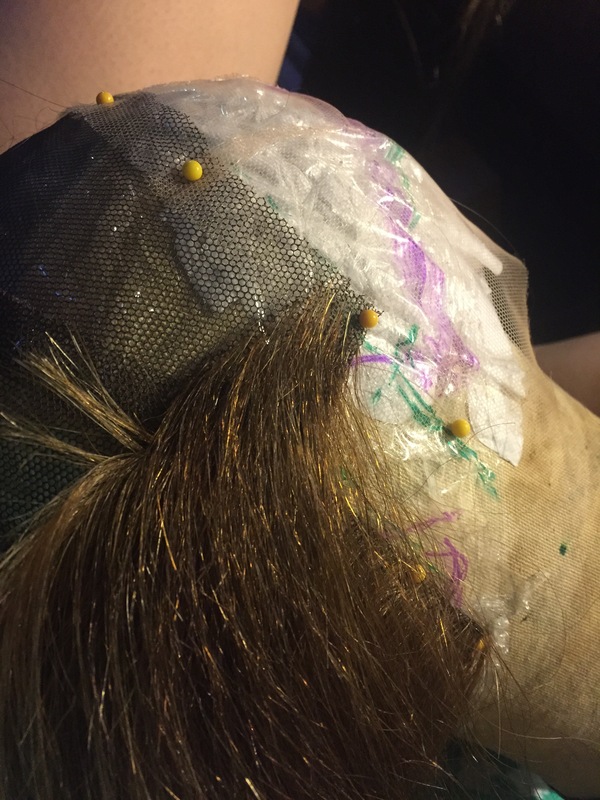 These are all the different hairs I used to create a color that is similar to mine, though a bit lighter and more coppery. 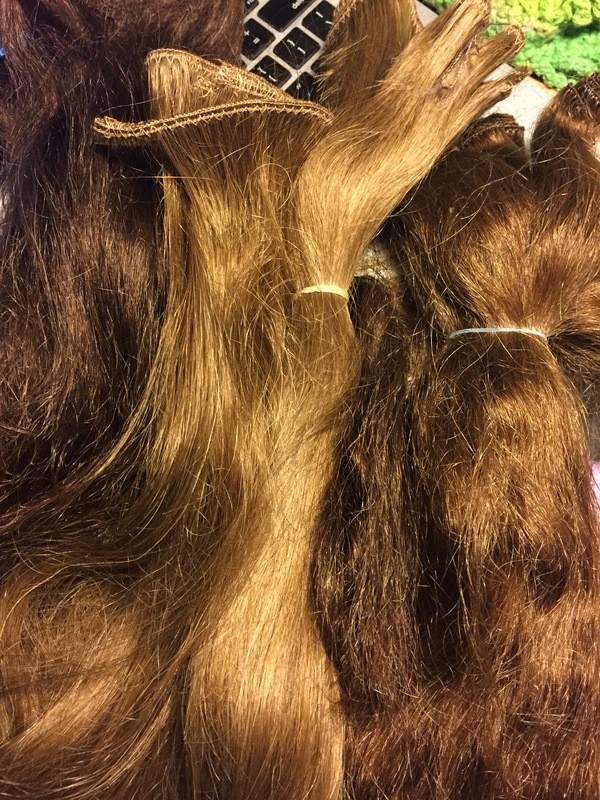 It is 16″long human hair in three different shades ranging from light ashy brown to auburn. 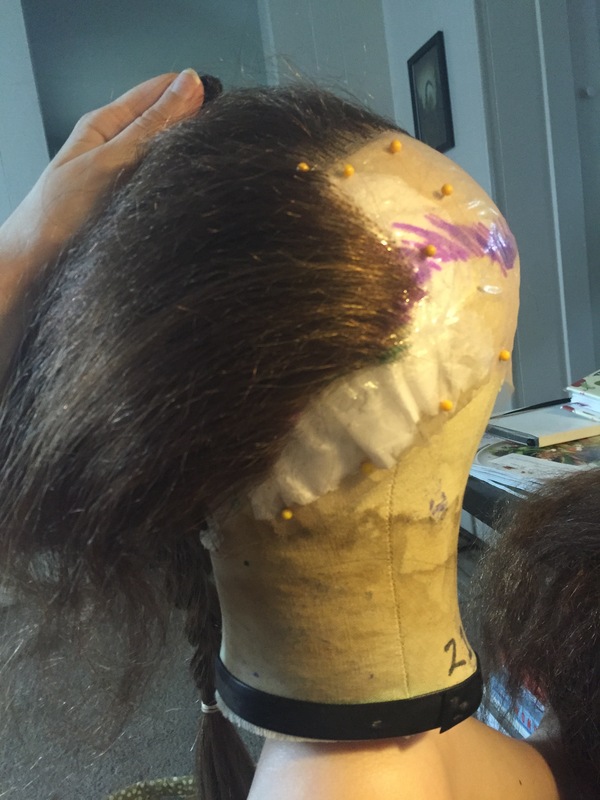 Some is very straight and smooth, and some has a courser texture that will make it easier for the wig to hold curl. 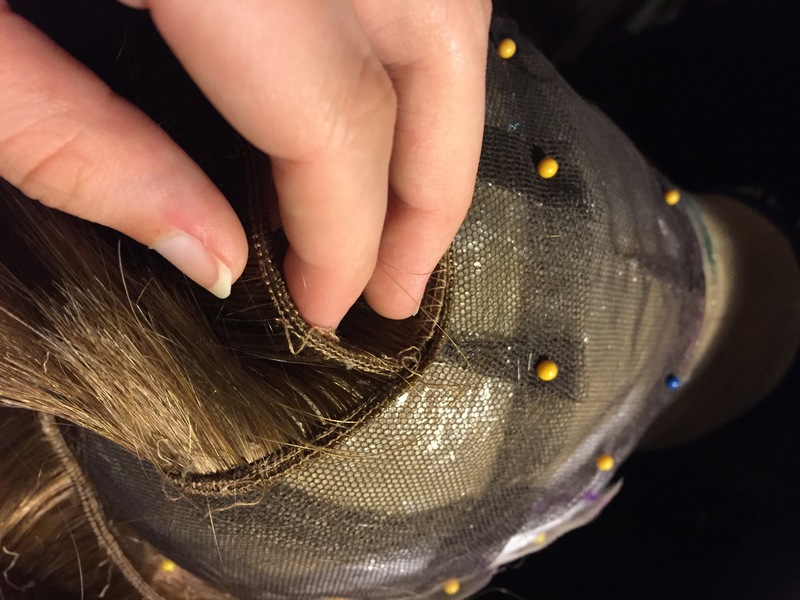 Since the wig is very long and thick, much of the back is wefted–meaning that I sewed on strips of hair. 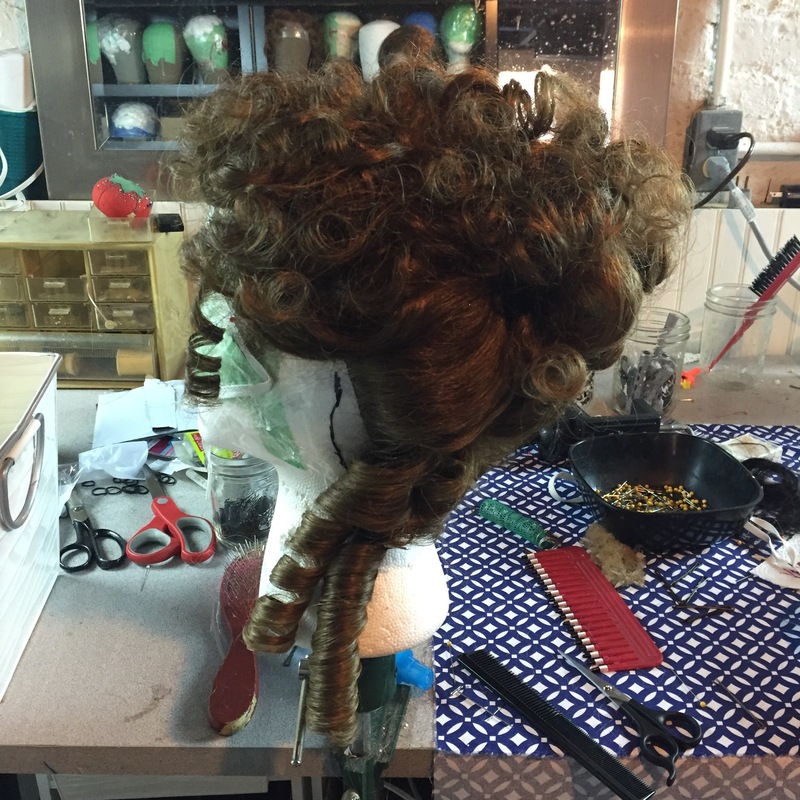 I attached the hair going up, since it will always be styled in updos. That way, the heavy hair wants to go where I need it to be, rather than pulling against the styles. 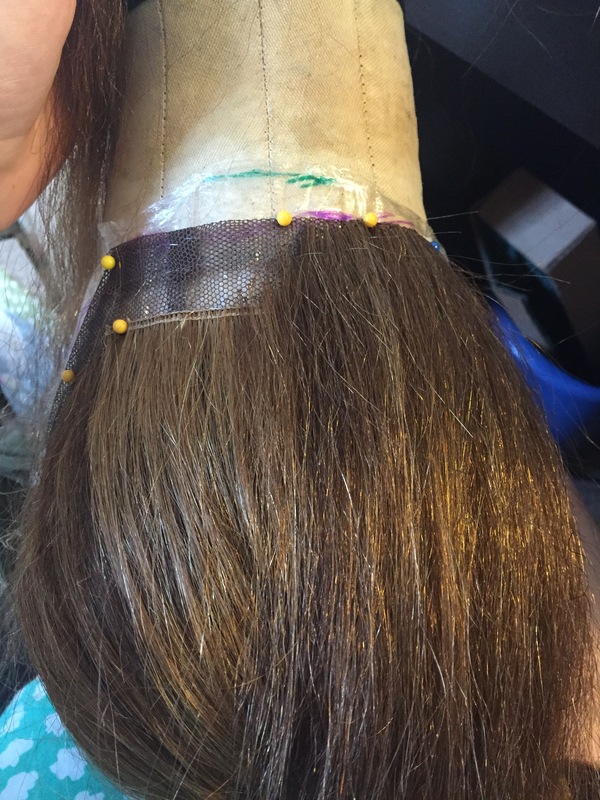 Since I was wefting with just the base color, I tied a bit of other colors in between the rows so that they would blend. From here, it’s all tying. 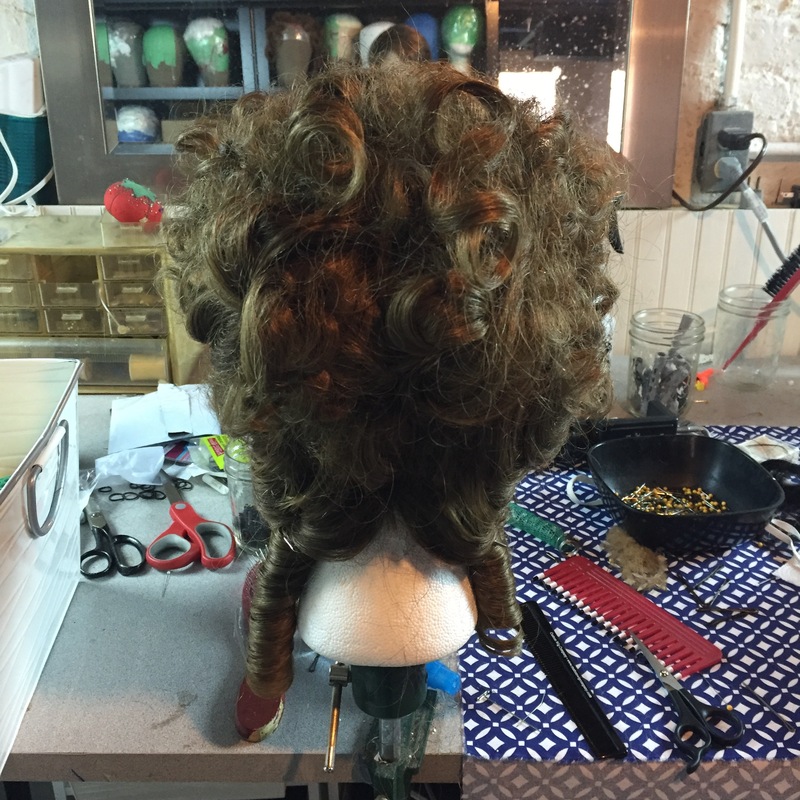 First the edges of the back, so that it looks nice with the hair swept up off the neck. 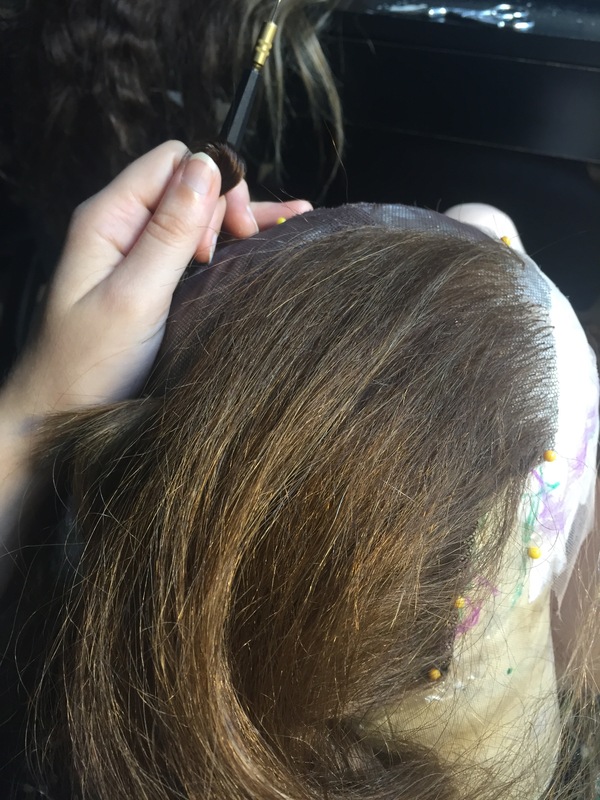 In the first picture you can really see the difference between the blended color and the ashy weft. 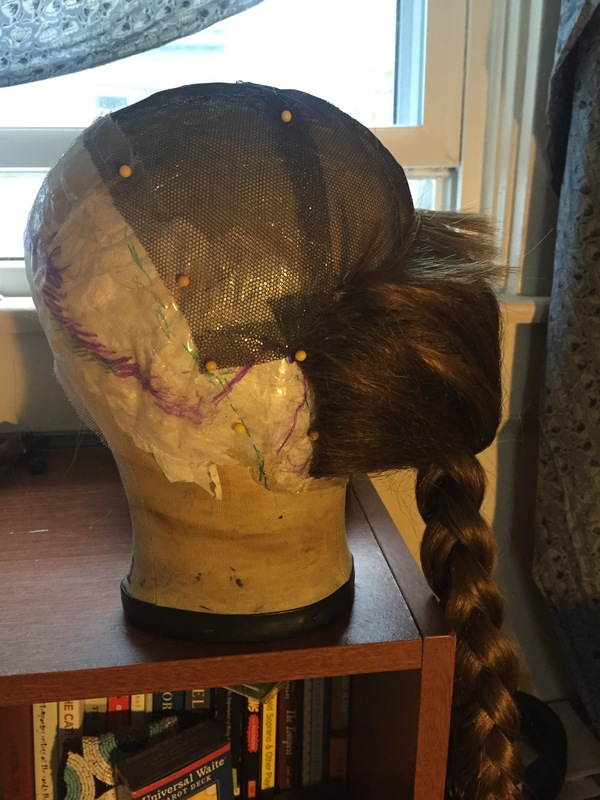 Here’s the progress so far, braided to keep it out of the way. 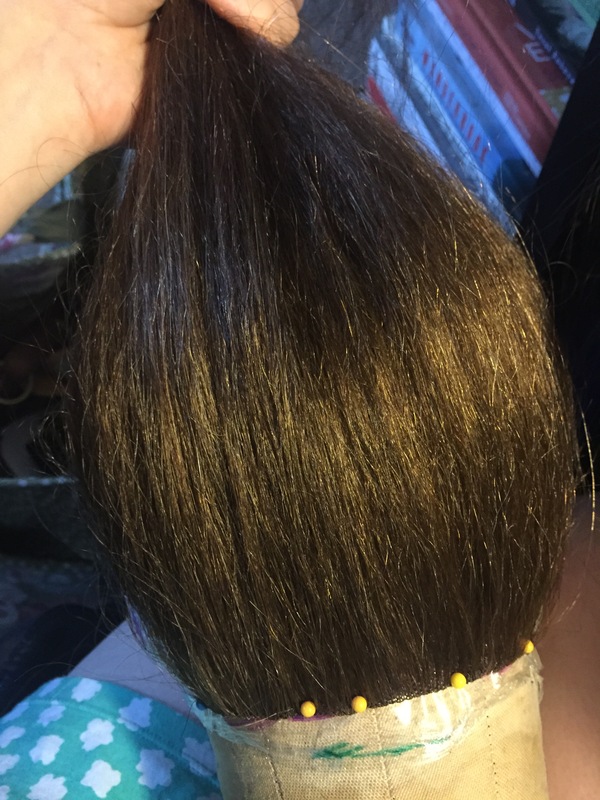 Each knot is a tiny cow hitch made with 4-8 hairs in the back and just one or two strands in the front in order to create a seamless-natural looking hairline with knots so small they are practically invisible and the hair appears to be growing from the wearers head. 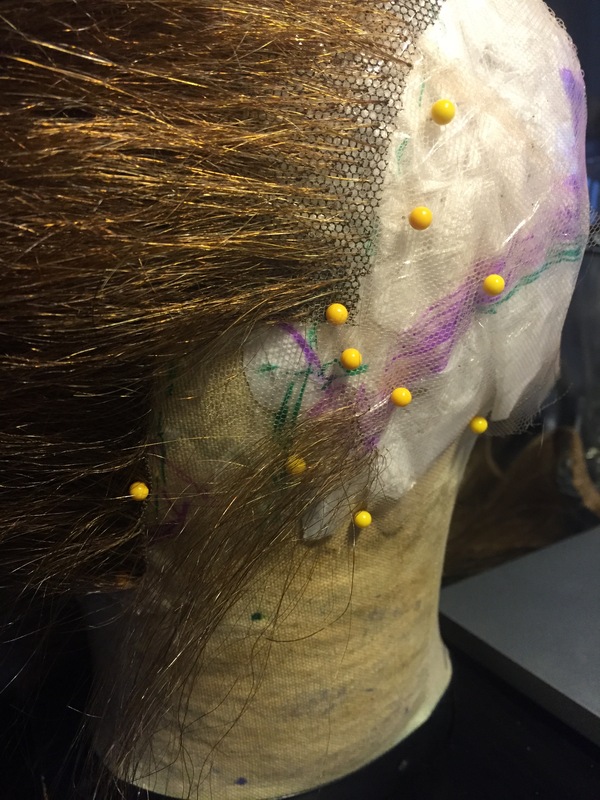 Something about the little sideburn areas on any wig makes them take longer than almost any other section. 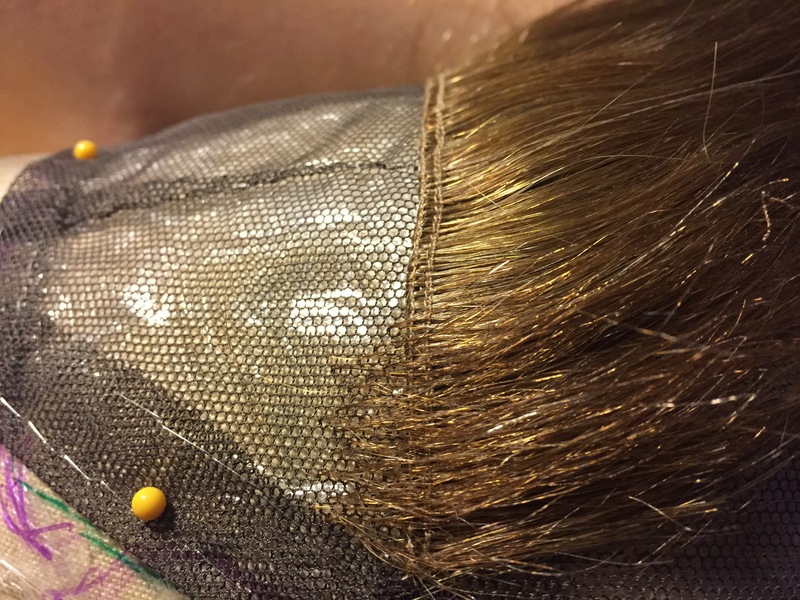 The only thing that takes (or at least feels) longer is tying all the teeny tiny knots as you close in on the very center of the hairline. 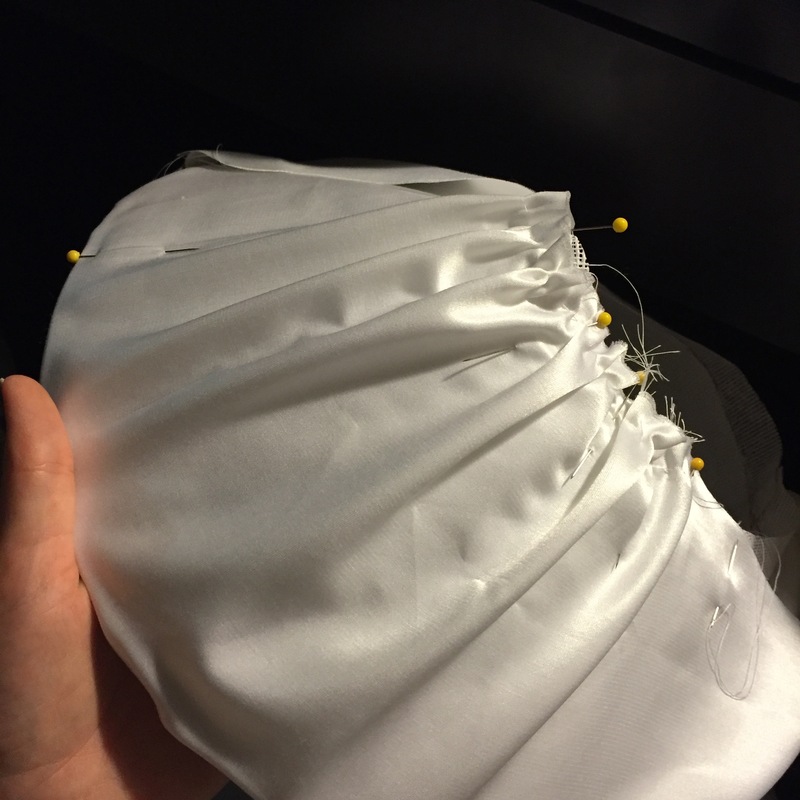 This is where most viewer’s eyes will be drawn, so the knots must be tiny and absolutely perfect. 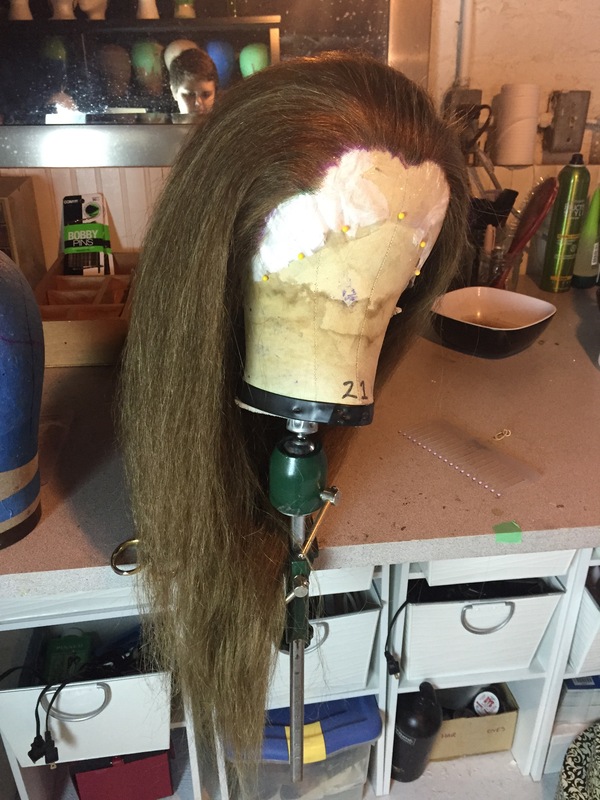 Here is the completed wig all combed out. You can see even more pictures from the day at my post about the event, which is linked above. Next year I’ll be adding early 1840s, 1872 and 1880 to its repertoire! 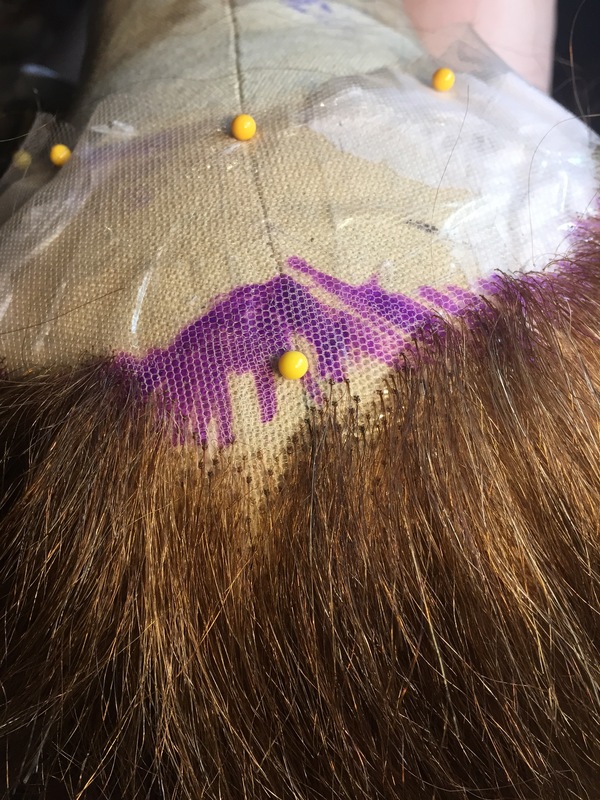 If you want to read more about making, styling and caring for wigs, check out Custom Wig Company’s blog Words of Wigsdom. 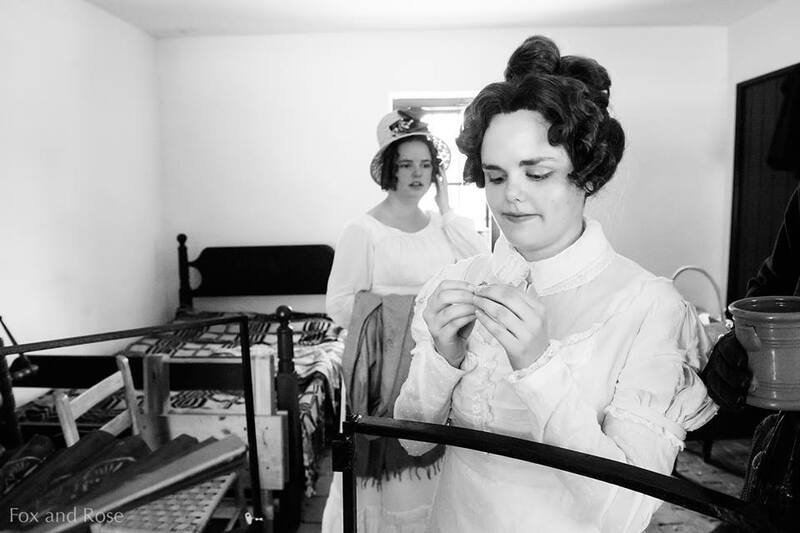 And like us on Facebook to see all the cool things we do! 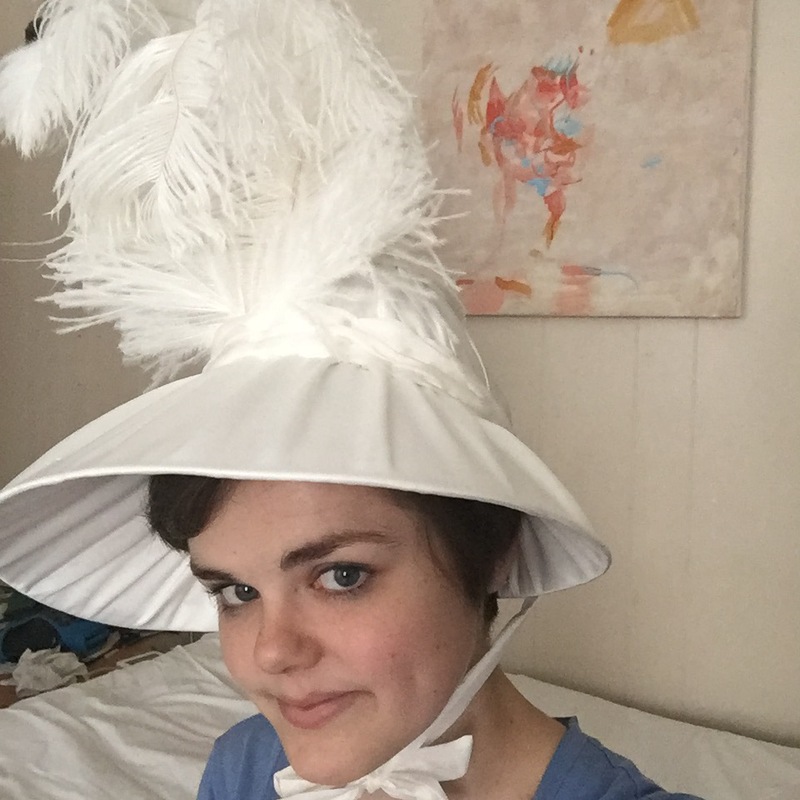 As long as I’m making hats, why not another one? 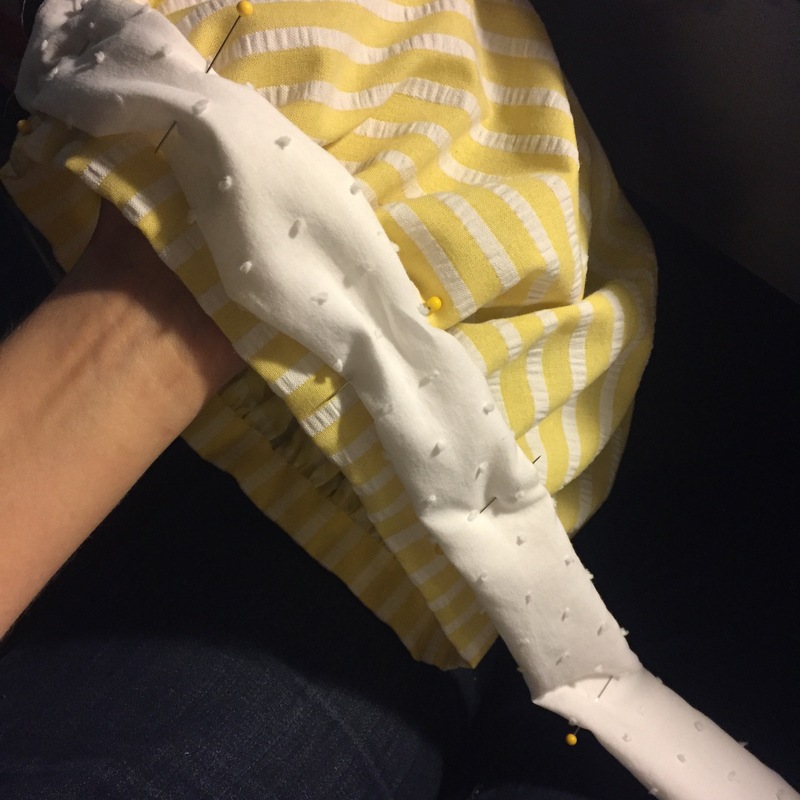 I’ve had a yard or more of the yellow and white striped seersucker left in my stash since I finished my pelisse in Déjà Vu in Yellow. 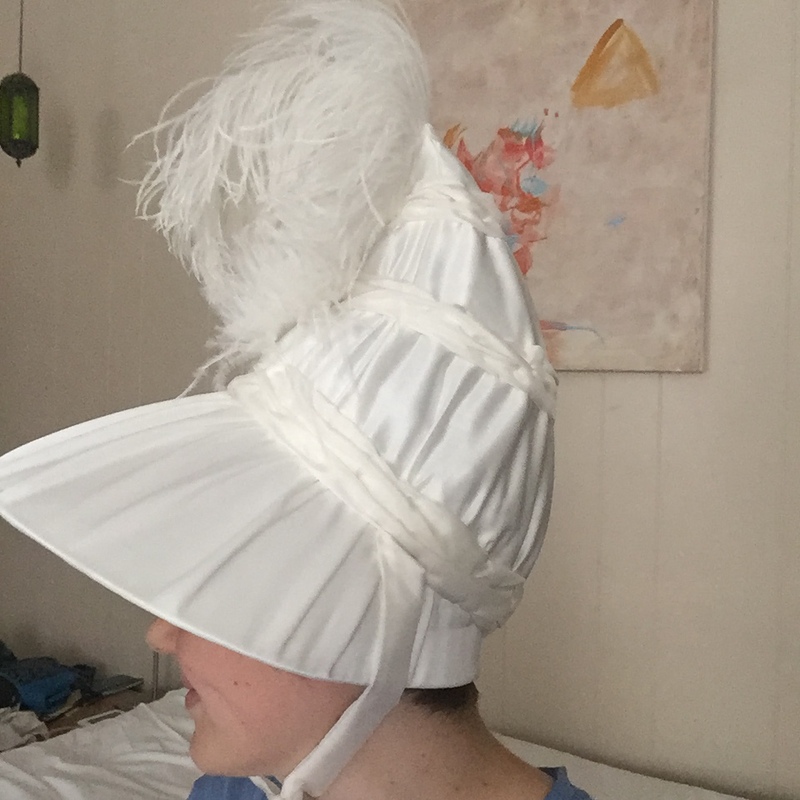 I made my new white bonnet to go with that pelisse, but hey, the fashion plate has a soft hat a bit like a tam in it, why not make one of those too? 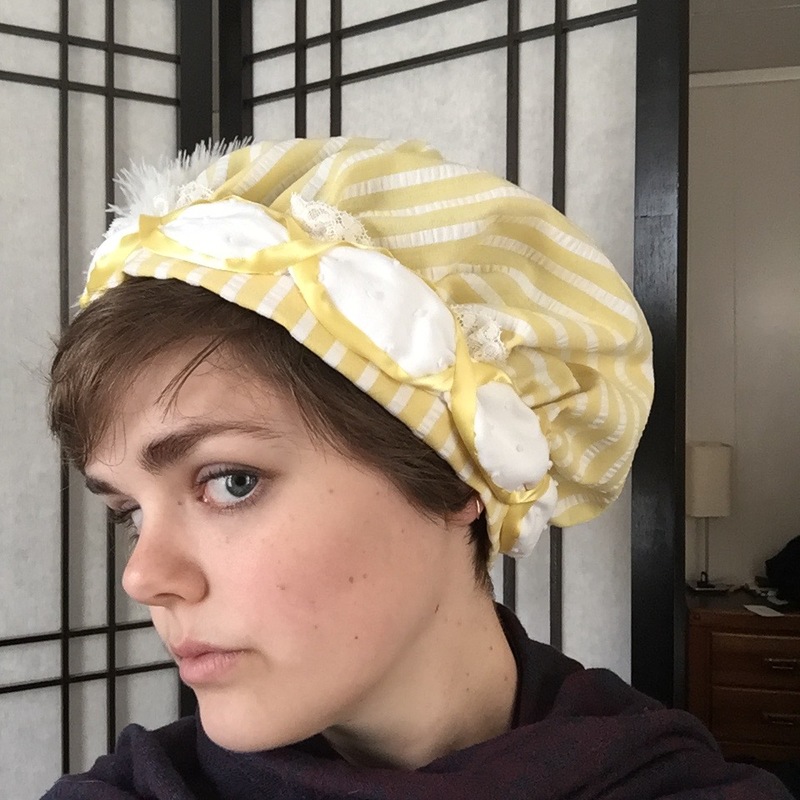 This in an incredibly simple hat to make–it’s just a circle gathered into a band that fits not-too-snugly around your head (with the proper hairstyle of course). 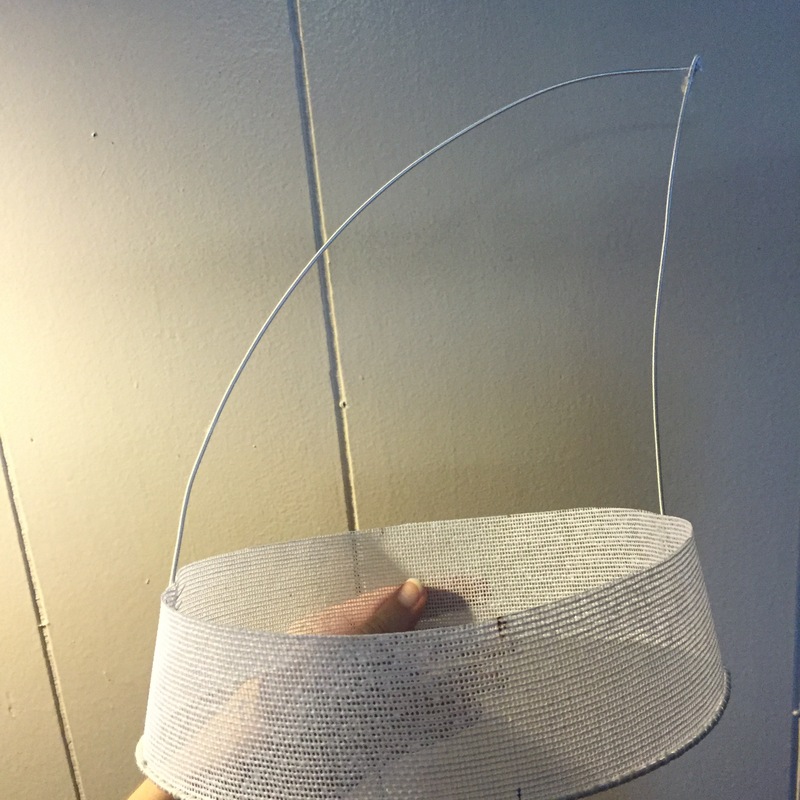 To get the size hat I wanted, my circle was 20 inches in diameter. 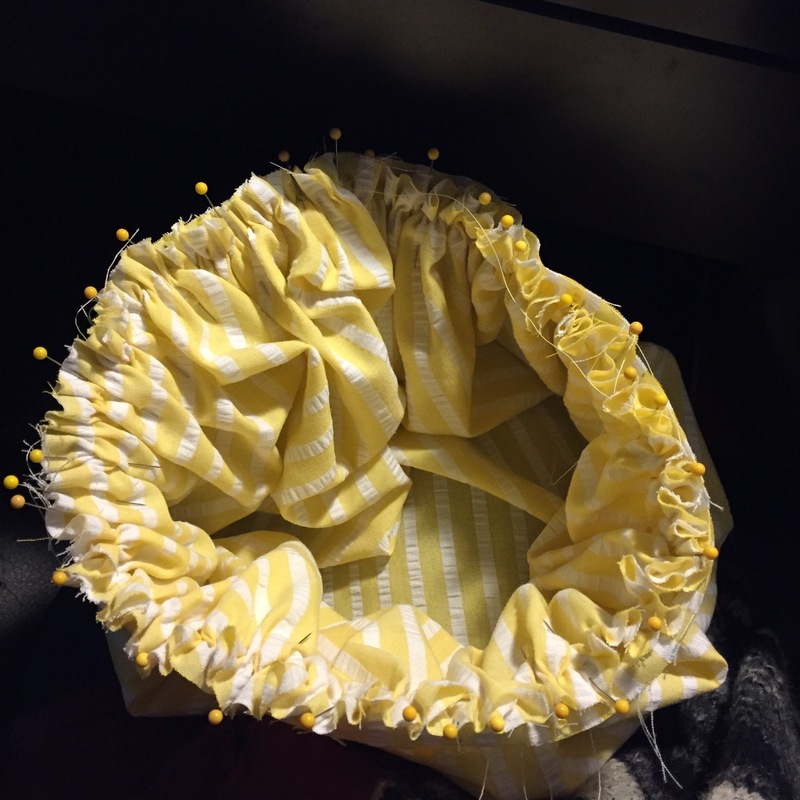 In order to make a decent circle, I used the top of my laundry hamper–don’t be afraid to search your house for appropriately-sized circular objects! The hamper lid was about 16 inches, so I just had to extend it a bit all the way around. 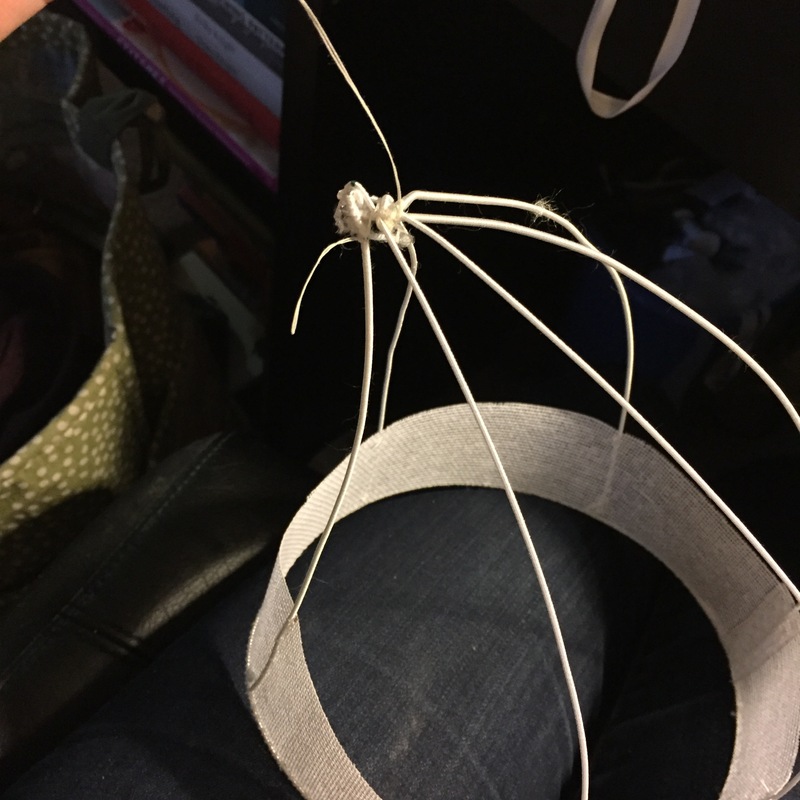 I did have to experiment a bit with circle sizes, and ended up gathering a lot of circles into that band, but now at least you will know that 20″ is a good place to start! 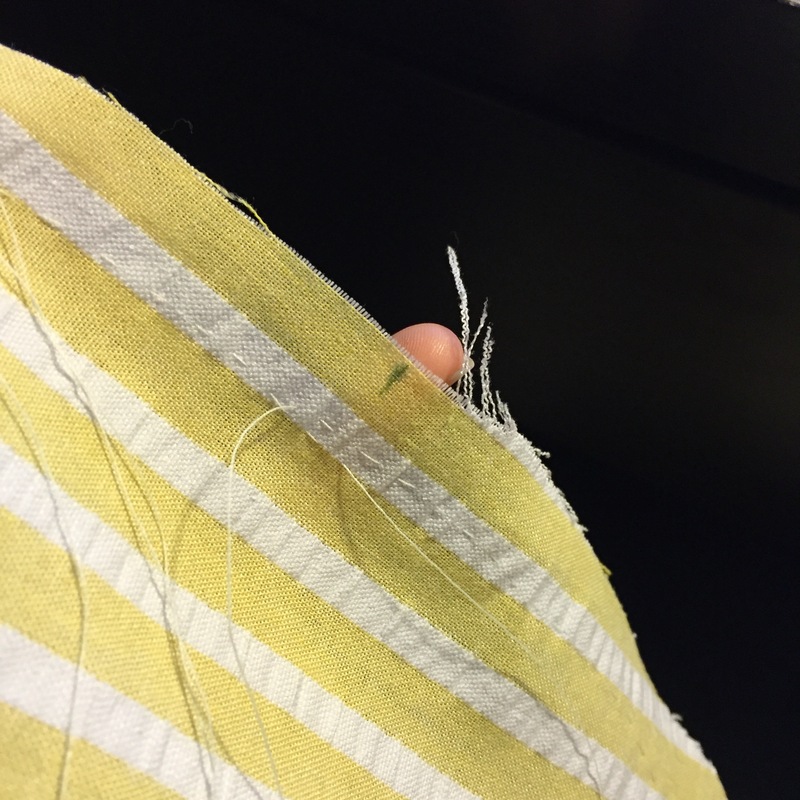 Once the band is folded around the seam and finished off, all that’s left is the trimmings! 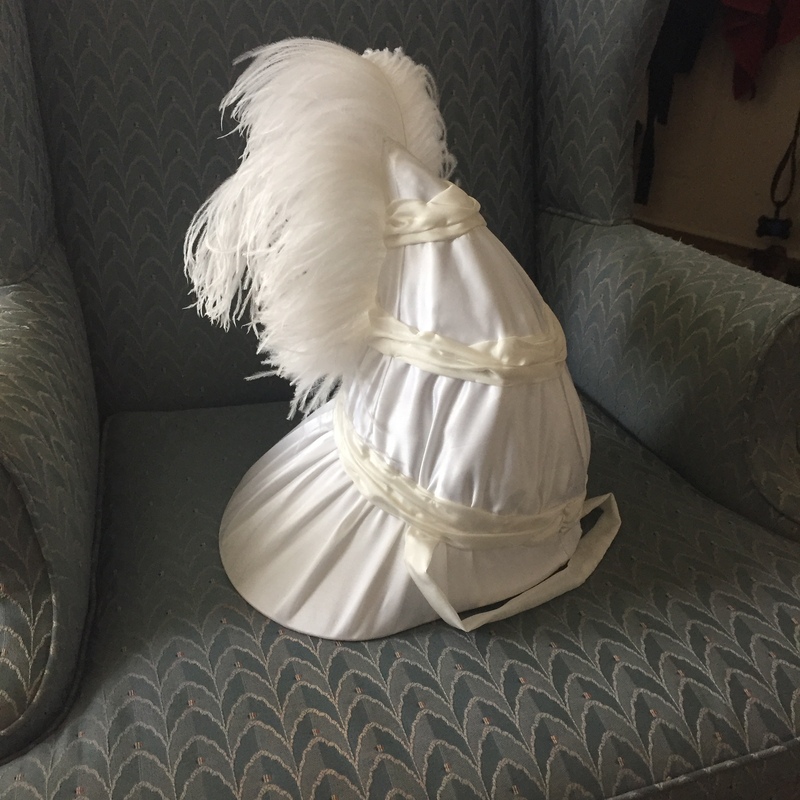 Of course there’s a world of options open to trimming one of these hats–feathers, flowers, rosettes, bows, ruffles, anything. 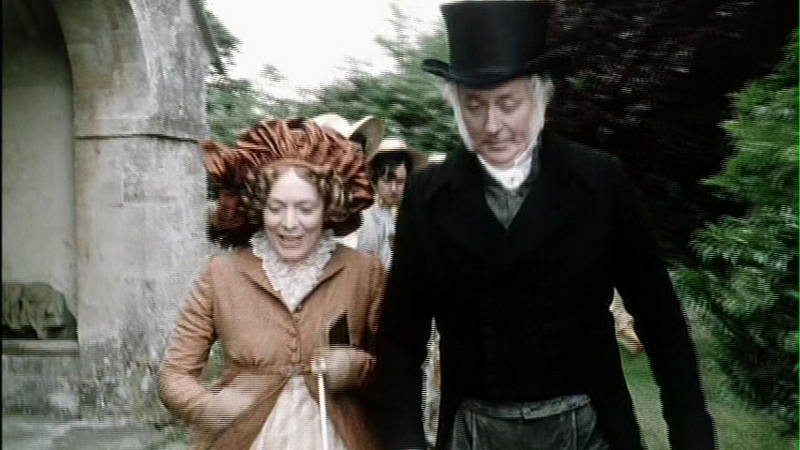 Check out the size of Mrs. Bennet’s hat in the opening scene of the 1995 Pride and Prejudice! One of my earlier attempts ended up like this. That one might have been more like 30″! Obviously it’s fabulous on her. 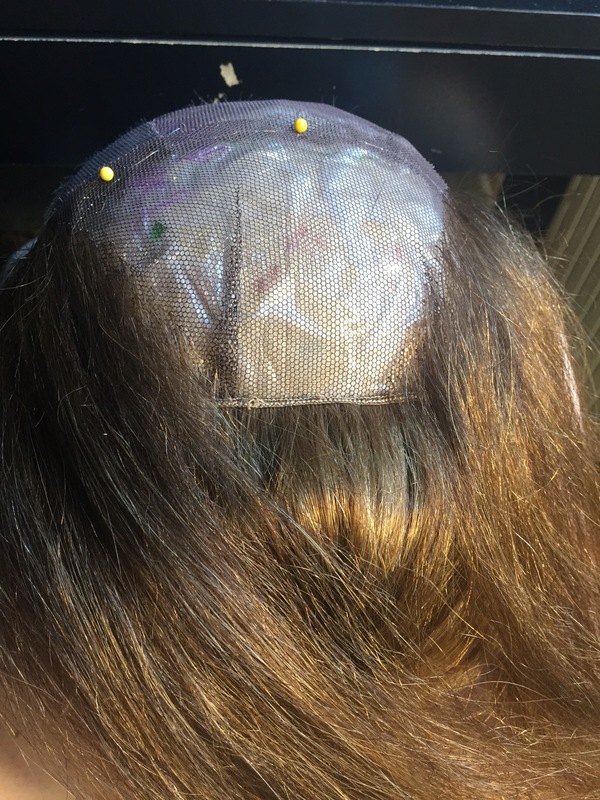 I decided to stick pretty close to the fashion plate in my trimming. 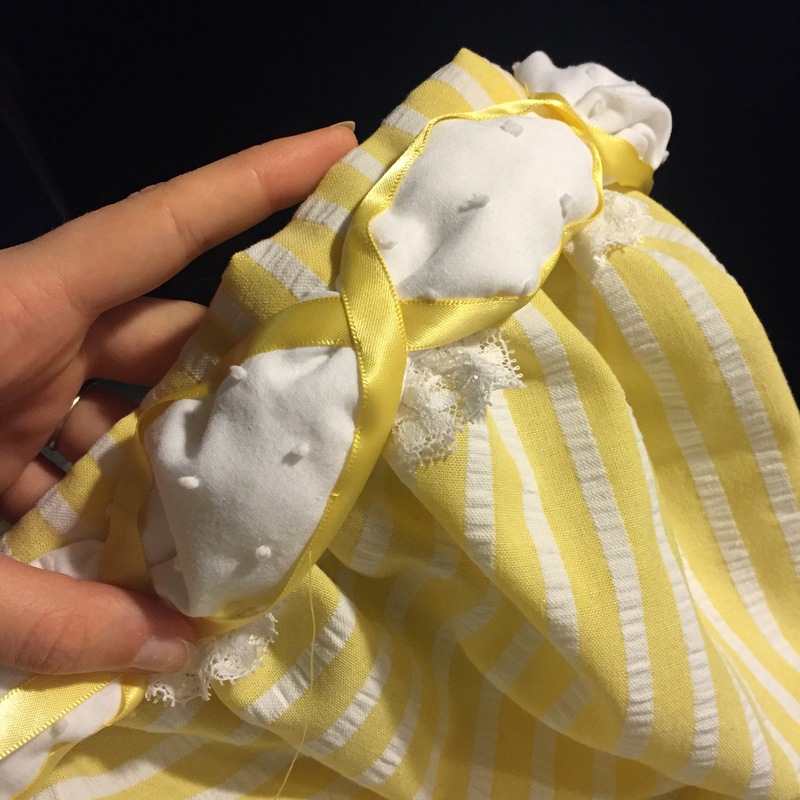 After all, I also had lots of yellow ribbon left over, plus a bit of lace from my grey dress, and a bit of white Swiss from my 1822 wedding dress. Plenty to work with! 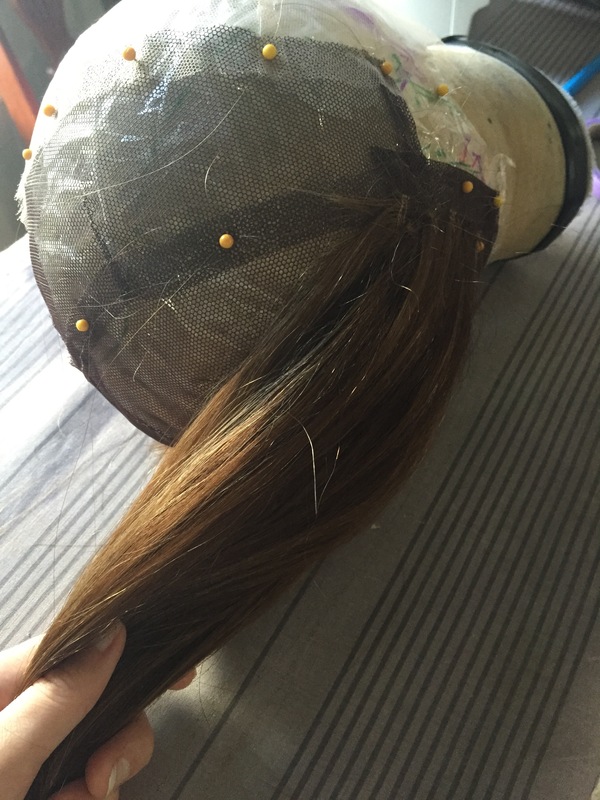 I started with a strip of the white Swiss rolled up in to a tube so that it had a bit of volume to it. 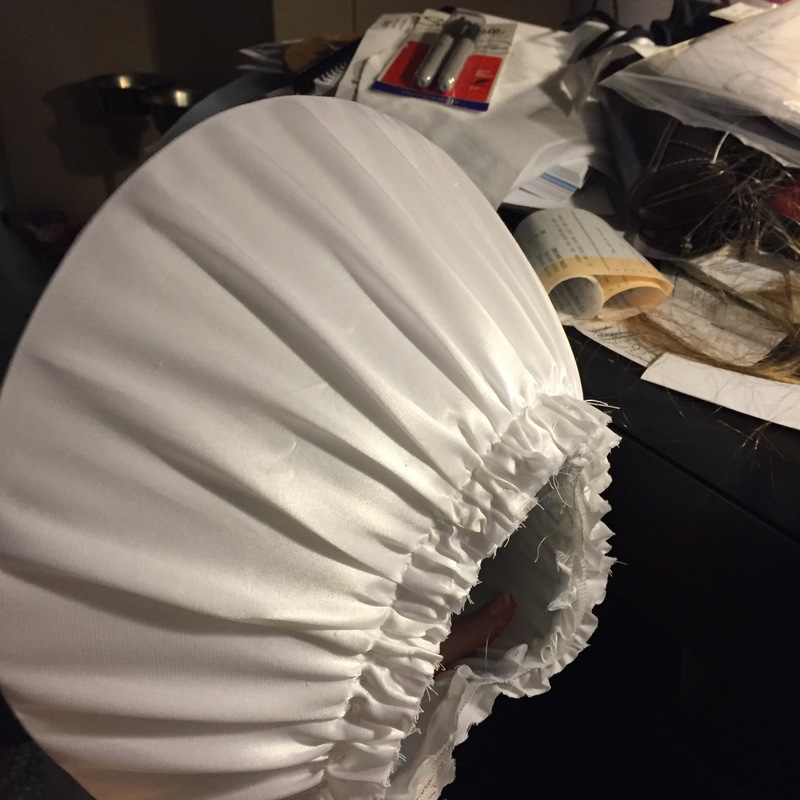 I tacked it along the seam between the band and the rest of the hat and gathered it up at regular intervals to form a row of poofs. 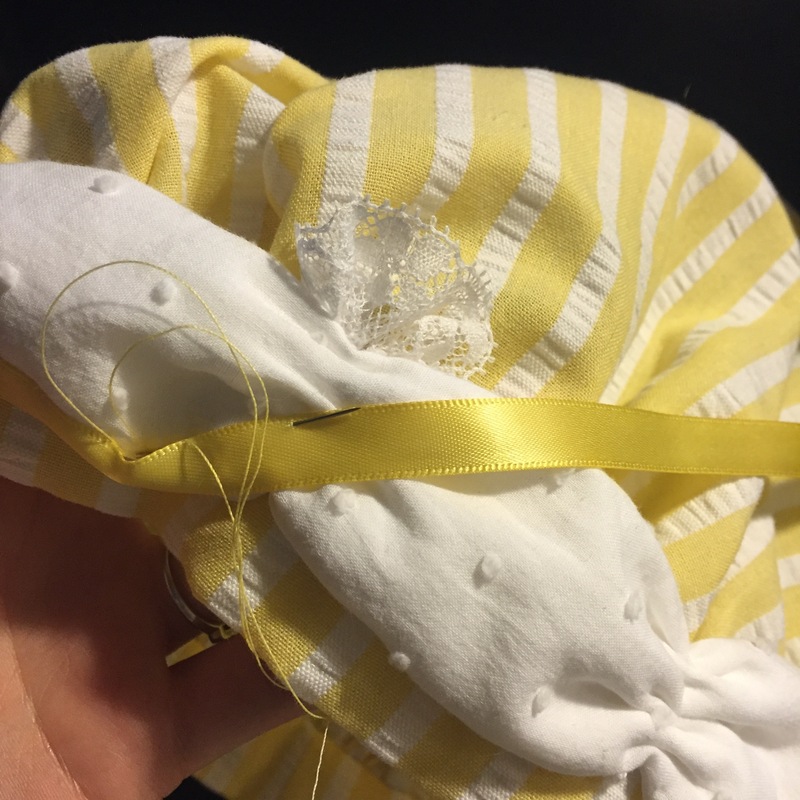 Then I took the yellow ribbon and tacked it along the the edges of the white and over the gathers in a figure-eight pattern. 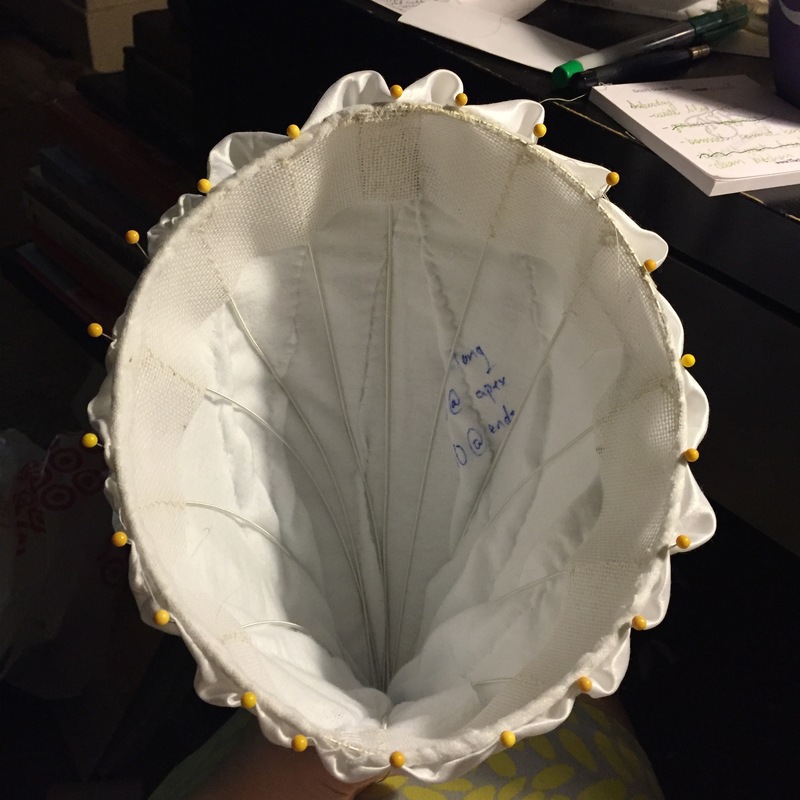 I gathered 2″ pieces of lace along one edge to make a little shell shape and tucked these into the top of each gathered area. 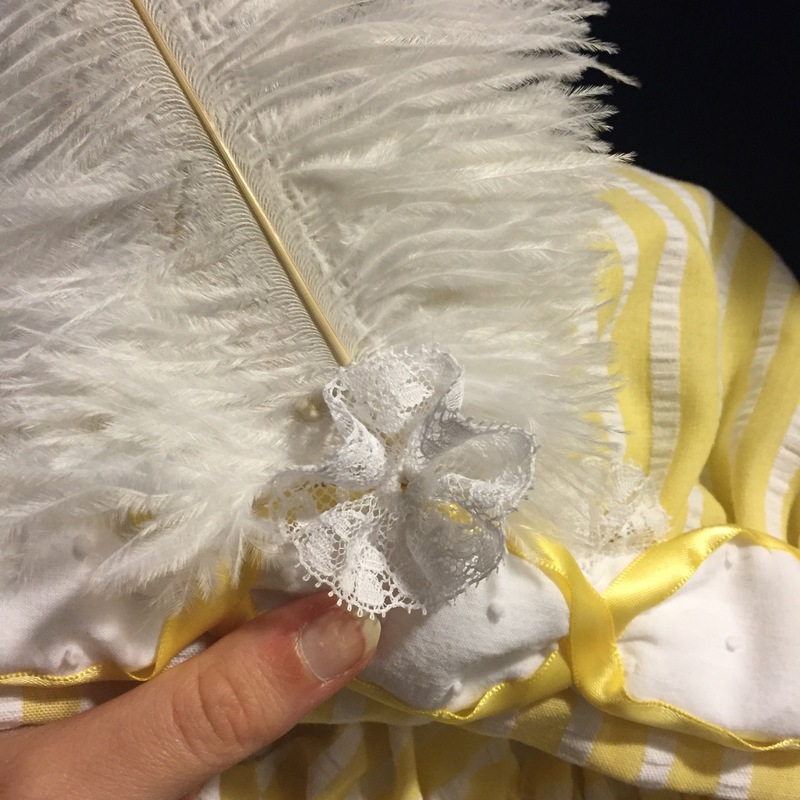 After that it was just feathers with another little fluff of lace at the base, and it was finished! 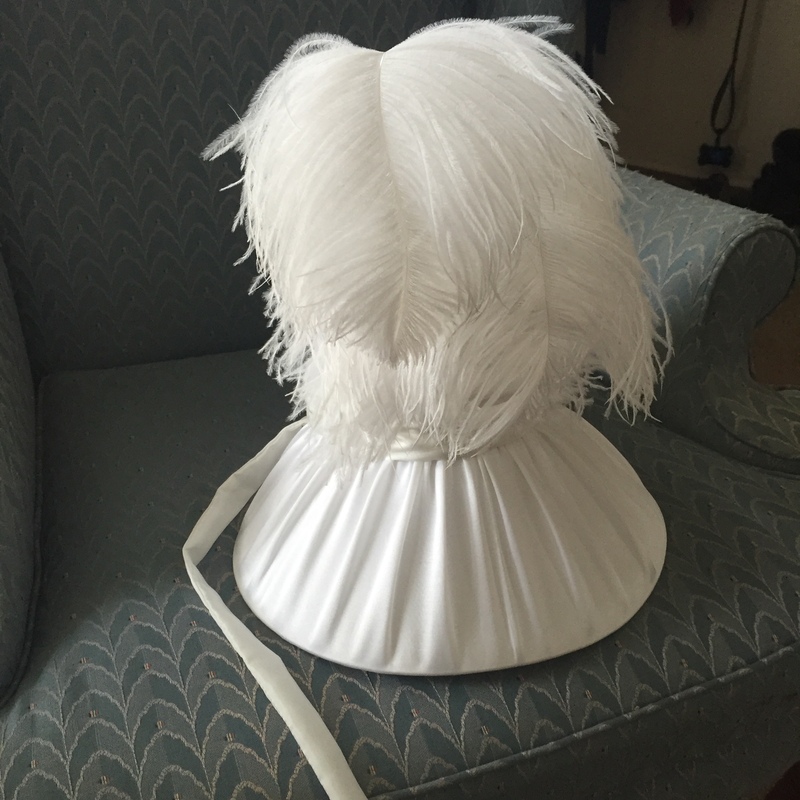 The feathers came from Matti’s Millinery and Costumes, who I met at the AGM. I used a scissor blade to give them a little bit of curl at the ends. And here it is! 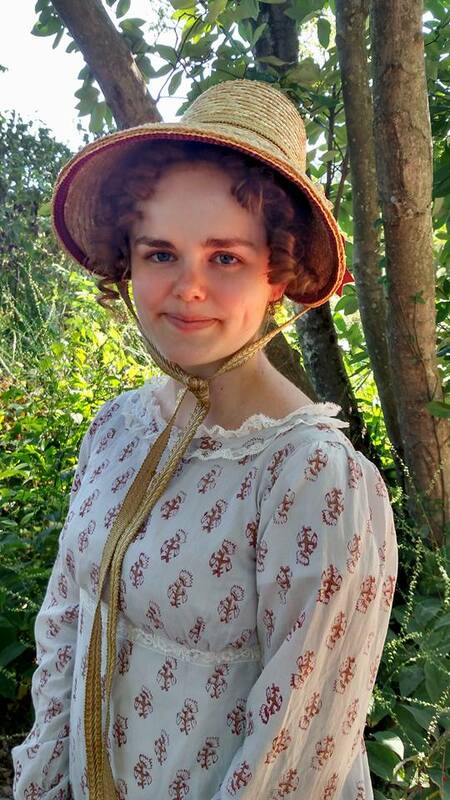 It’ll be a great hat for those hot summer days when a silk bonnet just seems stifling. Plus it’s always fun to shake up the wardrobe with a bit of something new! 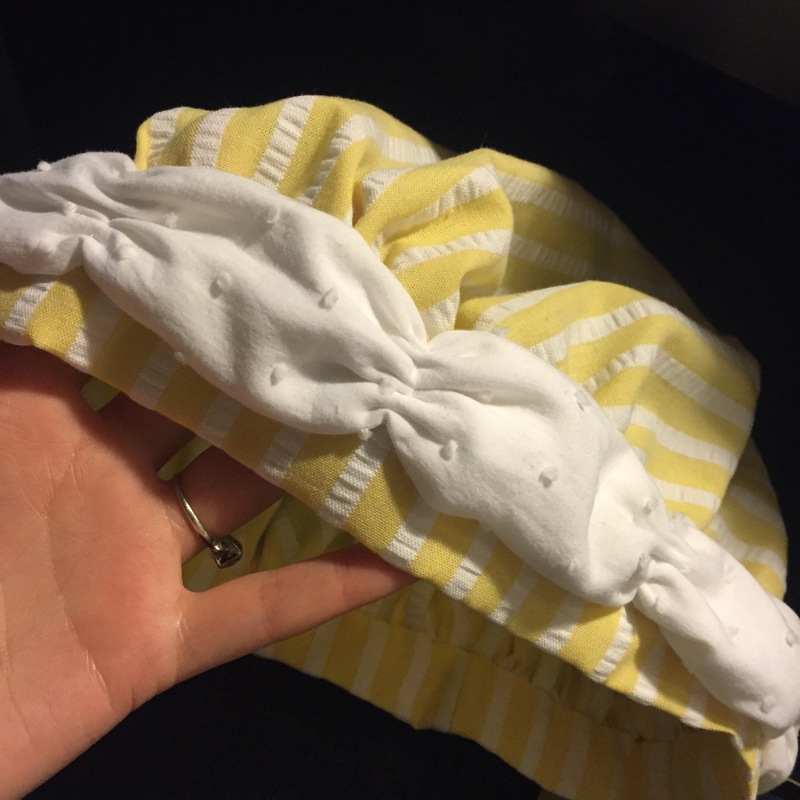 I would definitely recommend this as a very quick project to do when you have a yard or less of pretty fabric leftover from something else! Now I’m off to work on Christmas presents until my fingers bleed! 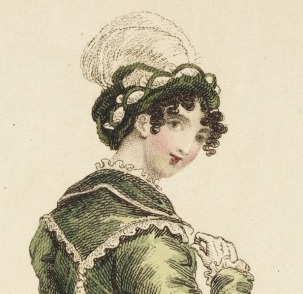 As you may have realized by now, I really enjoy adapting clothing from fashion plates. Sometimes I follow them very strictly, sometimes I use them as more of a jumping-off point for my ideas. 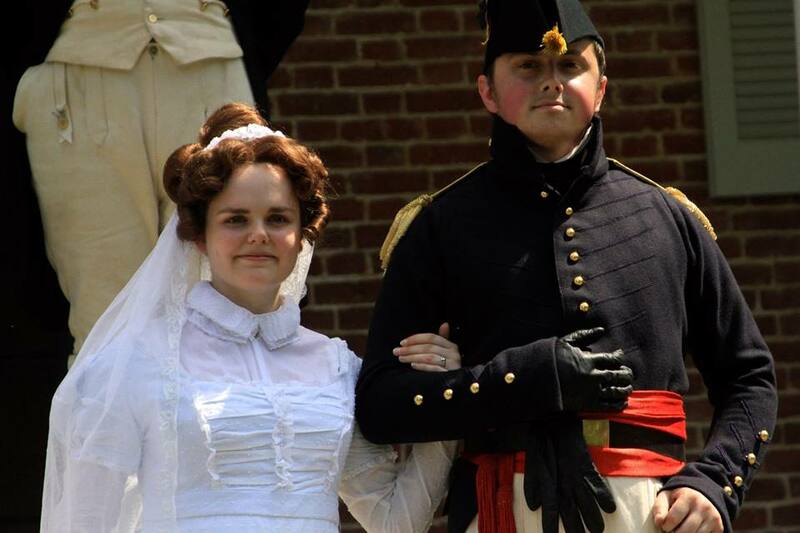 One of my favorite online resources for Regency costuming is the magazine Ackermann’s Repository, which is available in its entirety on Internet Archive. Ackermann’s is more properly called The Repository of Arts, Literature, Commerce, Manufactures and Politics, and was published by Rudolph Ackermann between 1809 and 1829. As you can see from the title, it is a very generalized magazine, which makes it a great resource for many aspects of Regency culture. Each issue includes serialized stories, news articles, meteorological reports, manufacturing news, reviews of new music, book recommendations, images of interesting places around the world, information about fashionable architecture and furnishings, and two women’s fashion plates, in addition to many other interesting things. There are also occasional embroidery patterns, especially in later issues. I often use the 1814, 1815 and early 1816 issues of Ackermann’s as research for my interpretation at Locust Grove. 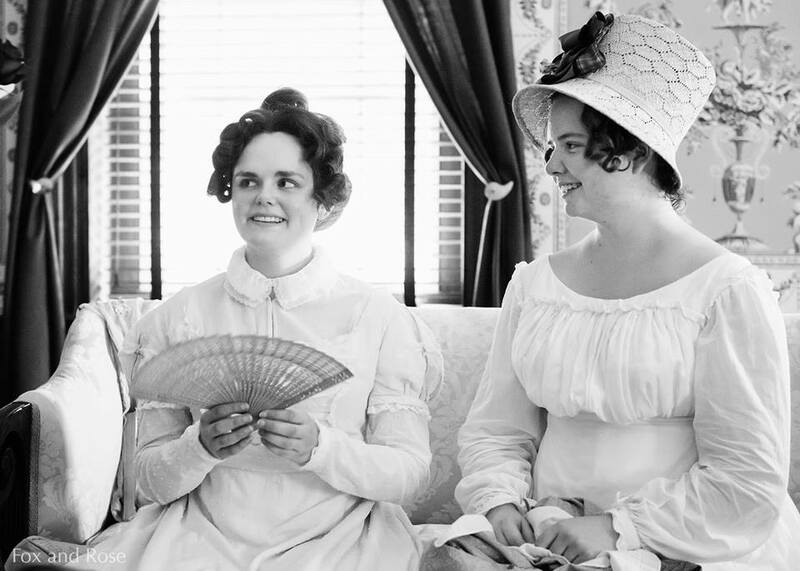 Though it was published in London, women of the time were extremely diligent about communicating new fashions with their far-flung friends and acquaintances, and a new issue of a periodical could reach Kentucky within three months of publication. 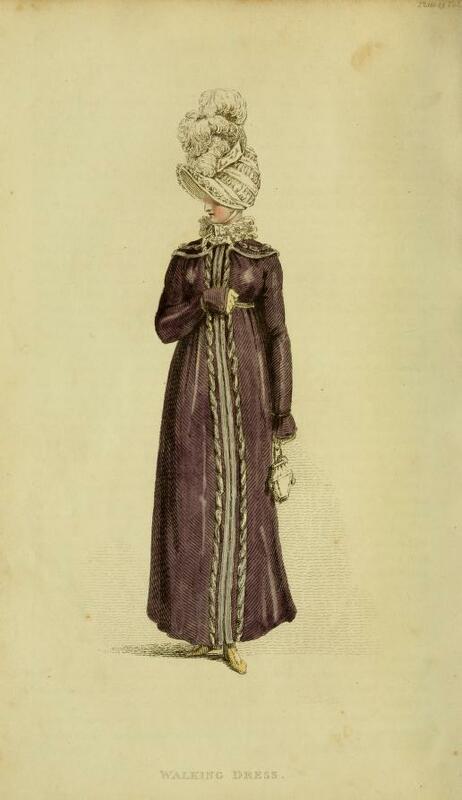 I fell in love with this bonnet from the March 1815 edition of Ackermann’s from the moment I saw it for its sheer over-the-topness. I knew I had to have it. 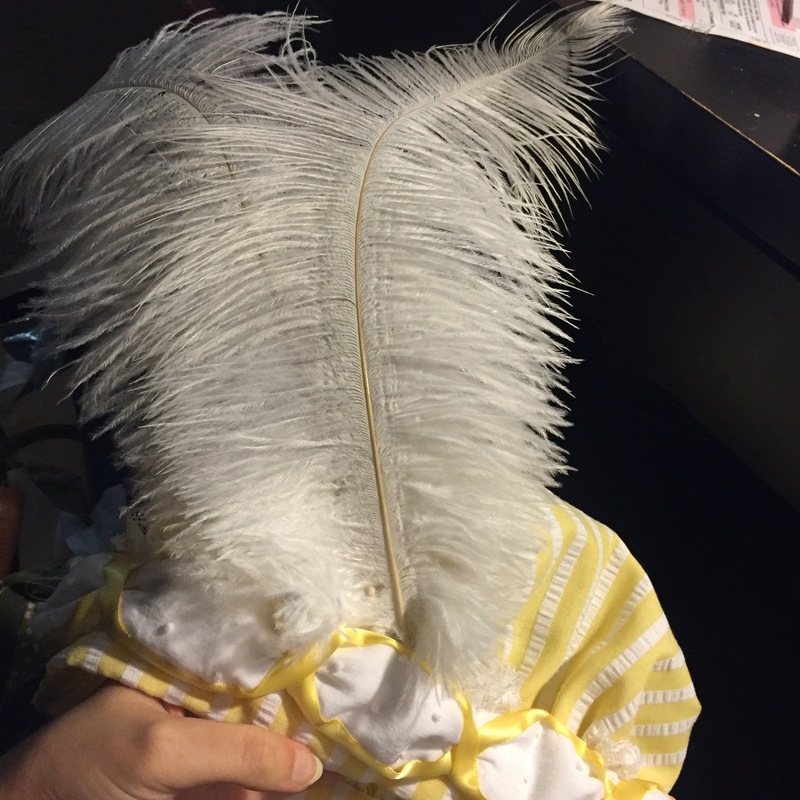 And what better to go with my yellow and white striped pelisse than a fabulous white feathered bonnet? 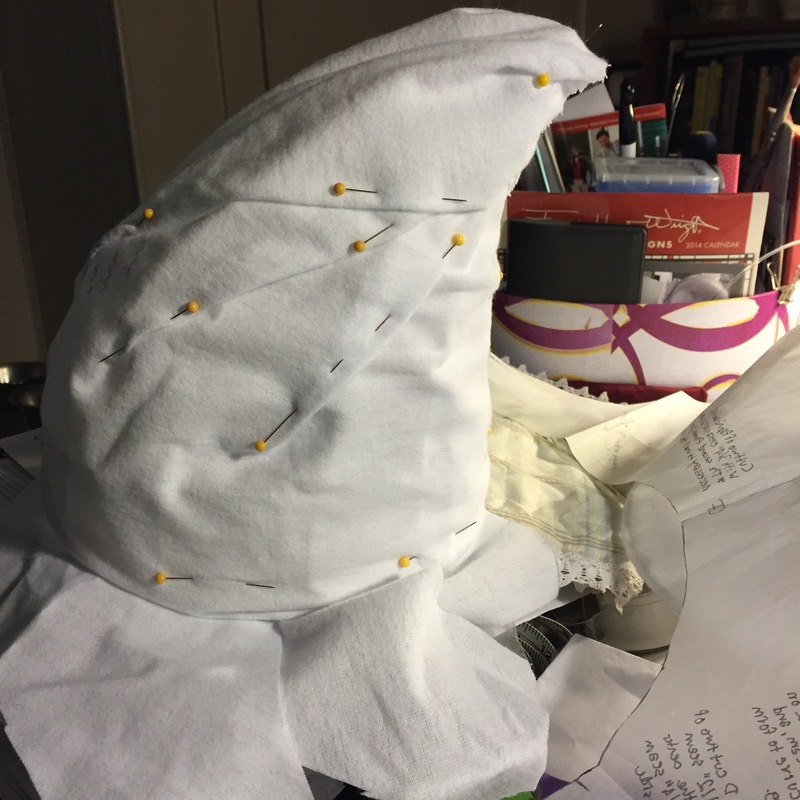 Now, let’s be honest, I have very little experience in millinery, and had no idea how to make that amazing cornucopia shape. After a few minutes of pointless poking around on the internet, I decided to just go for it. 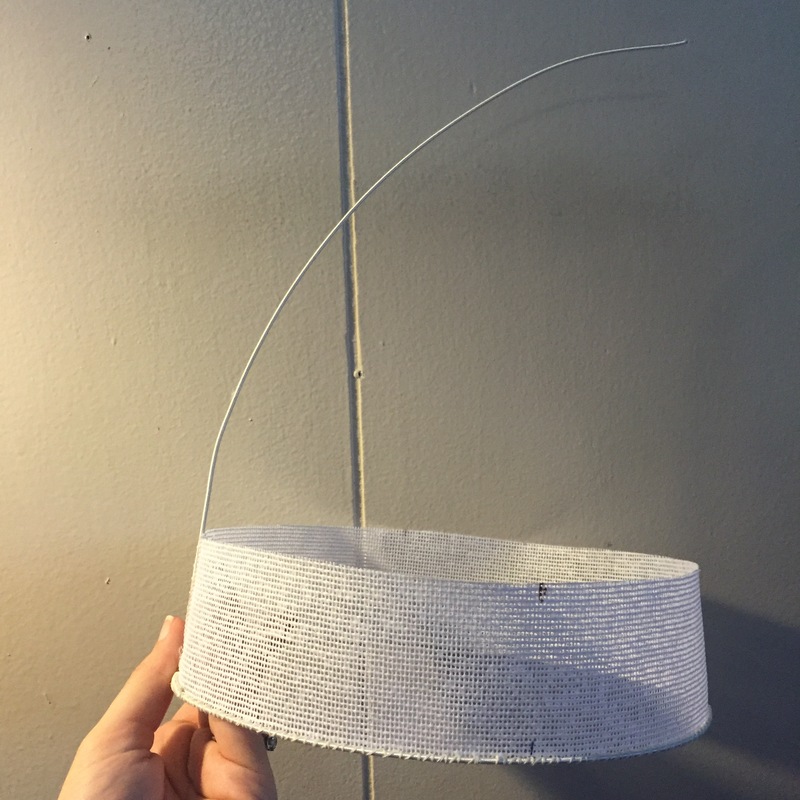 I made a narrow base for the hat crown from buckram, then built the rest out of millinery wire and hope. 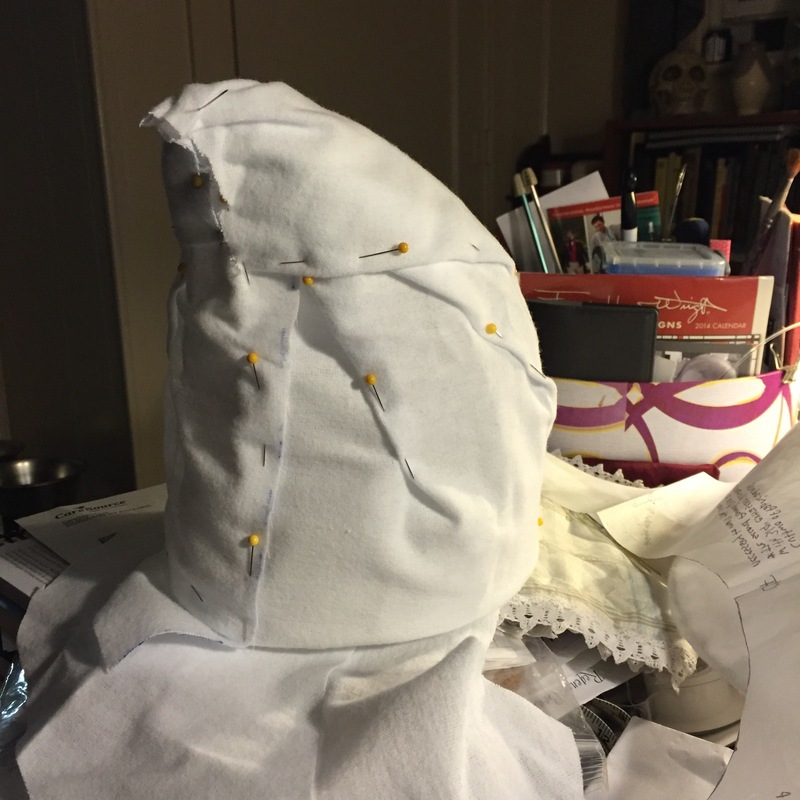 Before putting on the main fabric–silk satin in this case–I mulled the bonnet with cotton flannel. 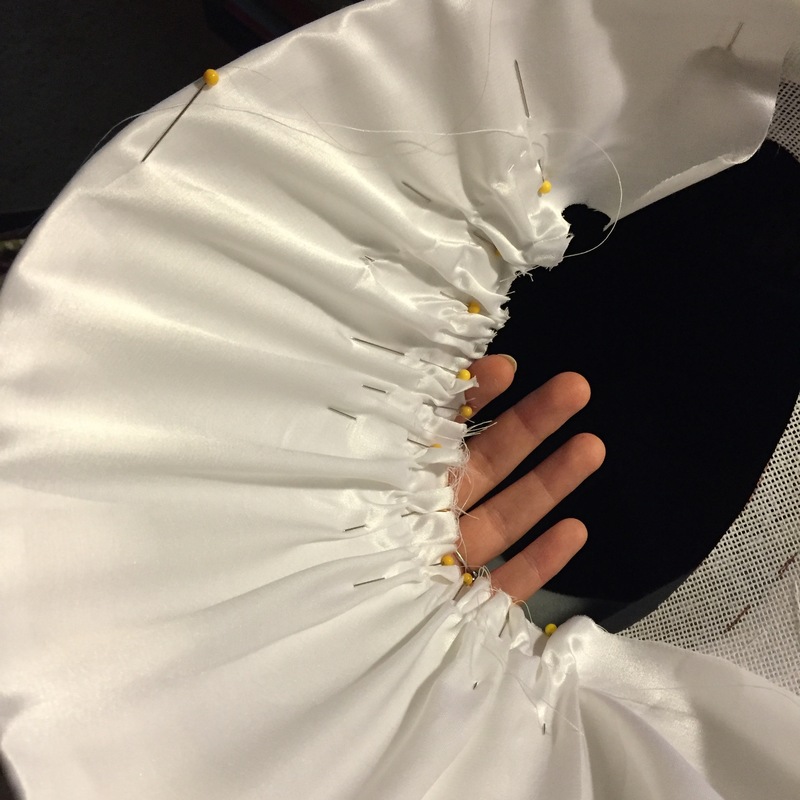 Mulling helps smooth the lines of the buckram form, and protects the delicate fashion fabric from the scratchy buckram and wire. 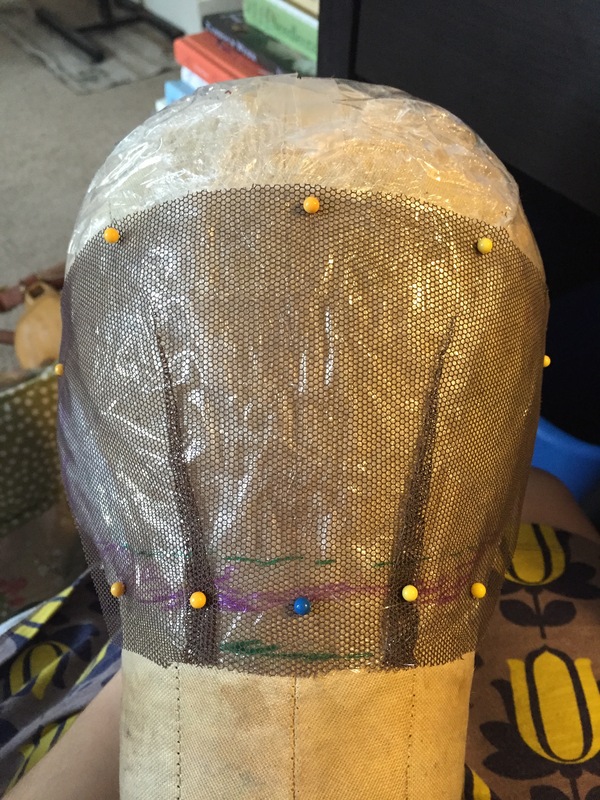 It wasn’t until after I started mulling the crown that I realized what shape I should have cut the flannel into for it to fit smoothly, but I decided to keep the original shape because the darts gave extra padding, and I figured the all-wire form could use as much padding as it could get. I sort of wish I’d put another layer of flannel on over the first one, but Kentucky gets extremely hot in the summer, and I didn’t want my head to cook. 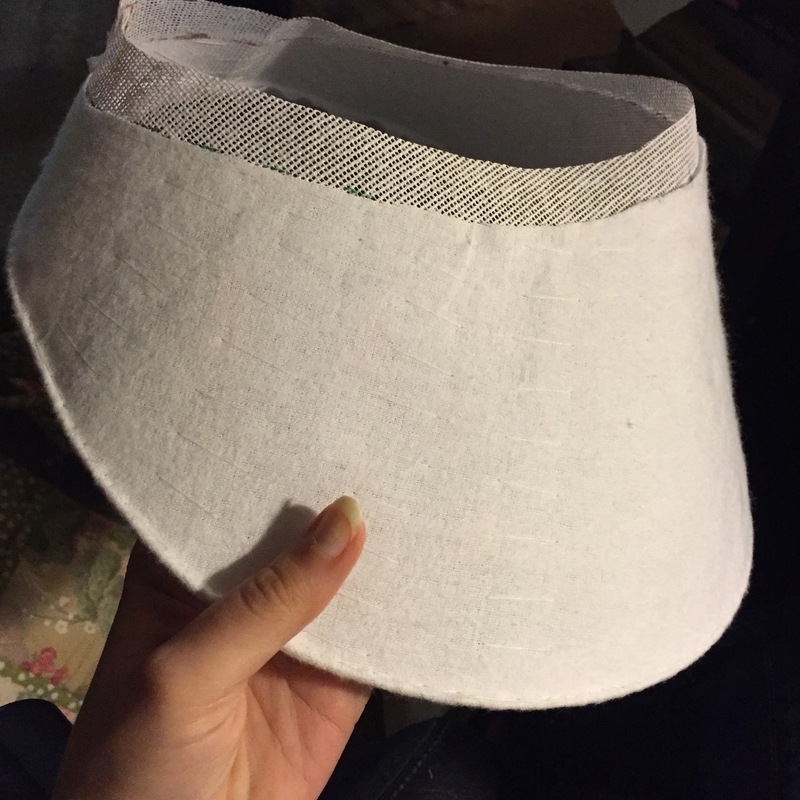 I only mulled the top of the brim, and wrapped the excess flannel around the edge to protect it. 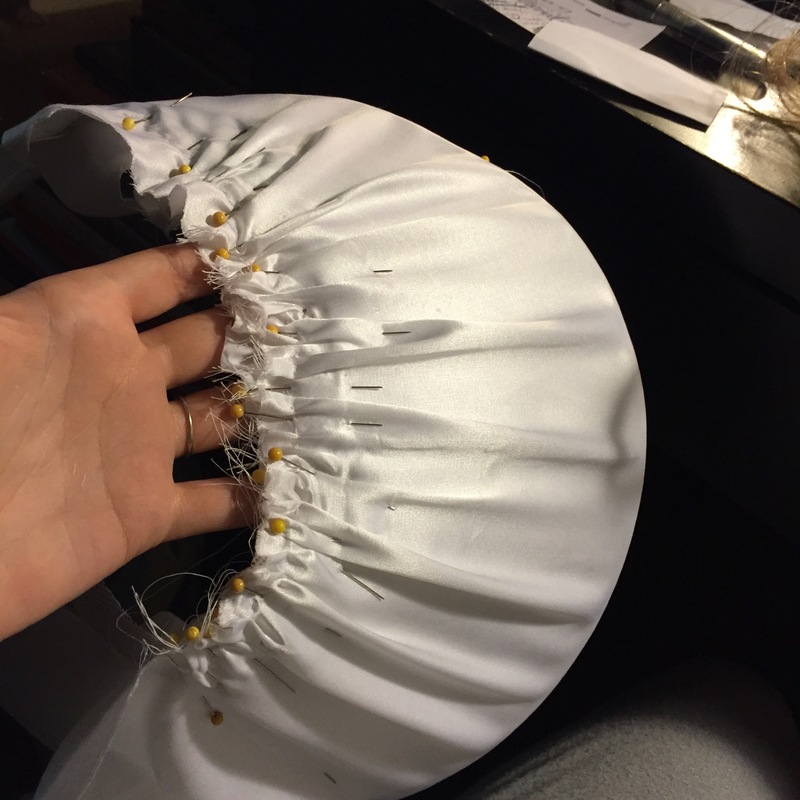 I didn’t use glue anywhere on the bonnet, because I hate working with it, so I used a sort-of pad stitch to secure the flannel smoothly to the buckram. Yes. 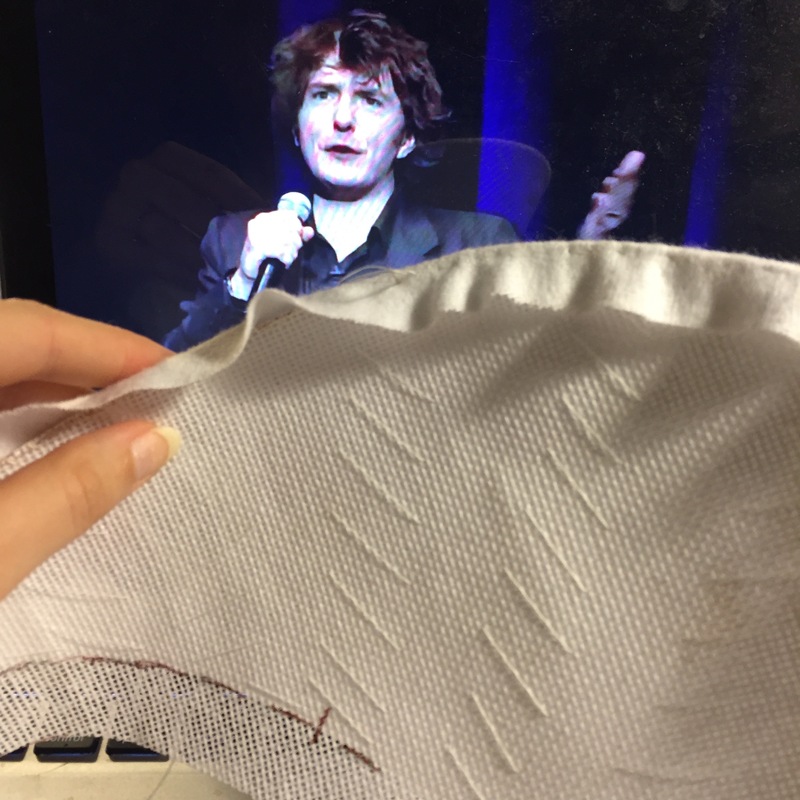 I was watching some extremely period appropriate Dylan Moran stand up while doing this. 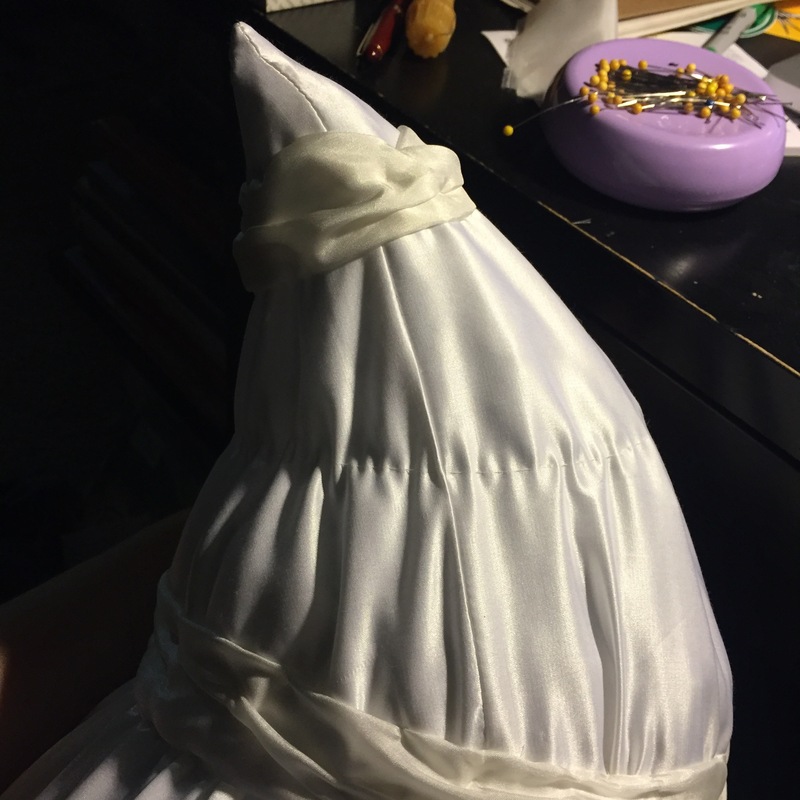 All of the fashion fabric was ruched, which makes covering the bonnet nice and easy, since you don’t have to worry about getting the fabric to lie perfectly flat. Although you could probably argue that getting nice, attractive gathers is just as tricky. 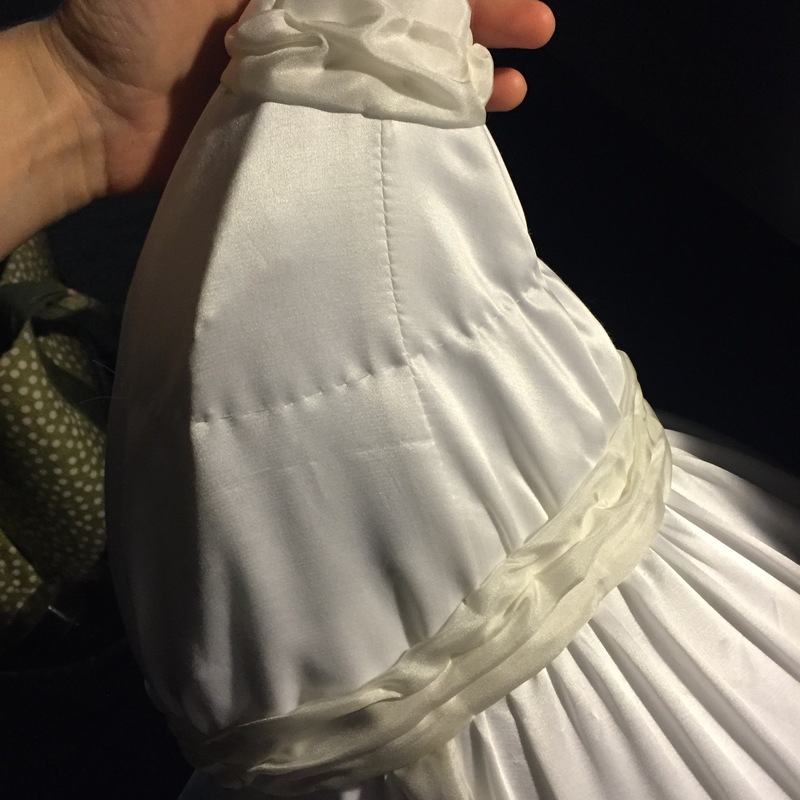 The brim cover was a single piece of fabric, gathered into the crown on both sides. 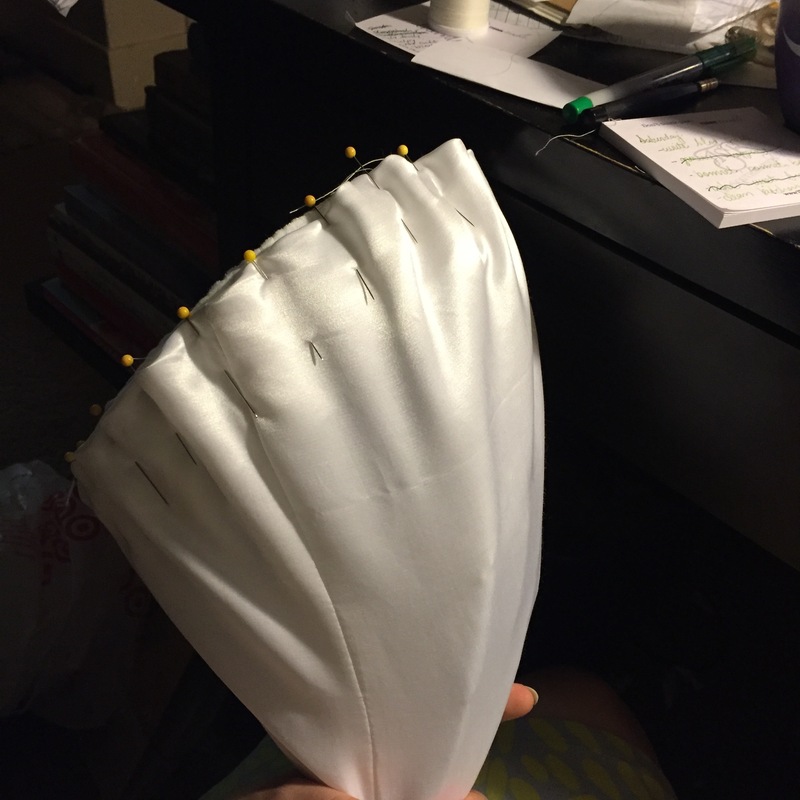 The first piece I cut was a bit too short in a few places, so I was forced to cut a new one. 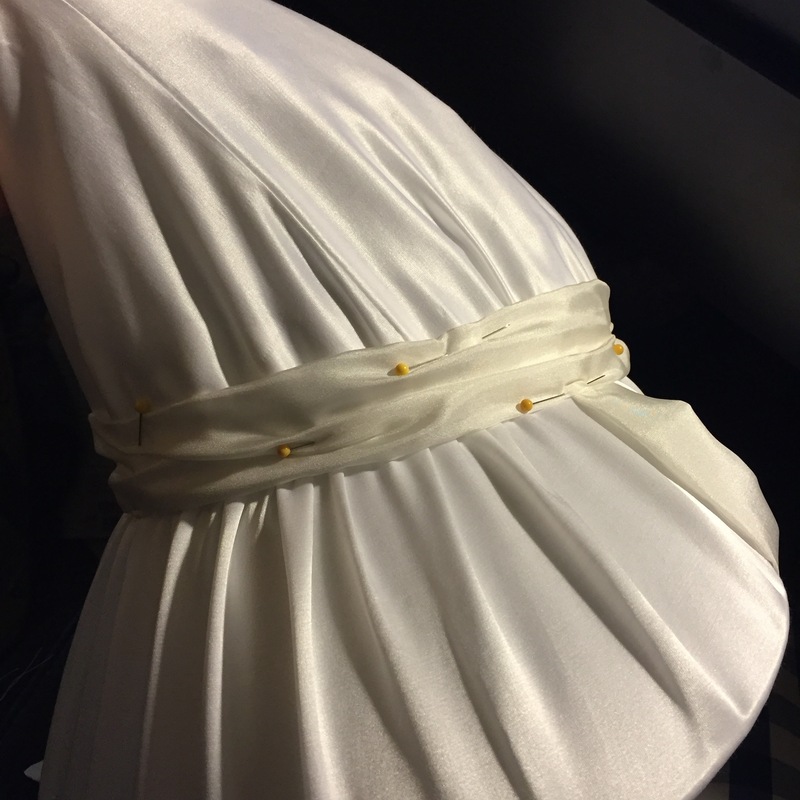 Now, I had originally planned to cover the crown by cutting out a full circle of the satin and gathering it down, but remember how I had to cut a second brim piece because of being silly? So the full circle was not to be. 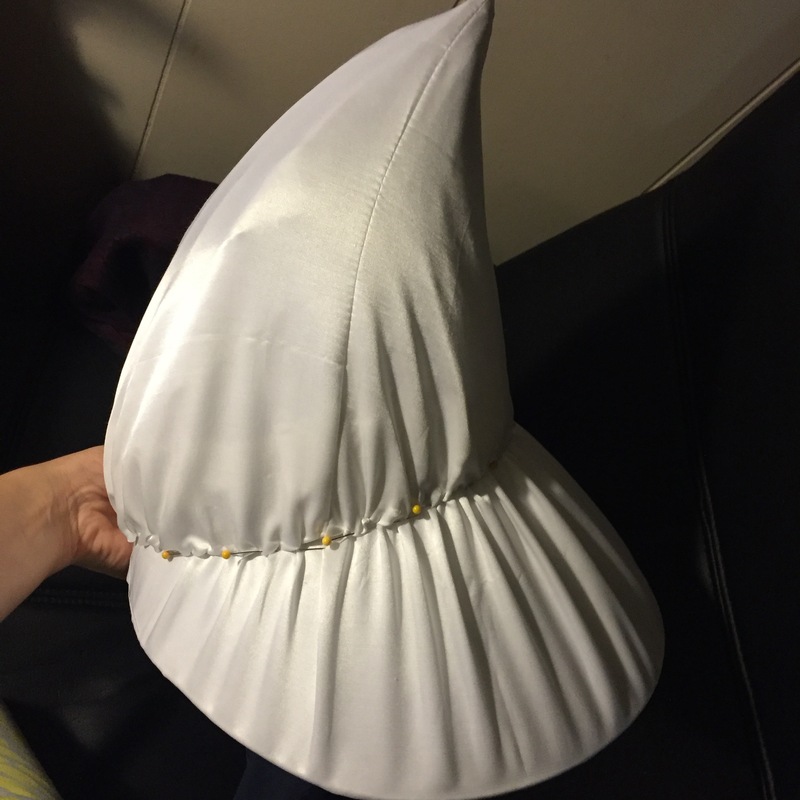 Instead, I had to cut two quarter-circles and sew them together, so I was covering the crown in a cone of fabric. 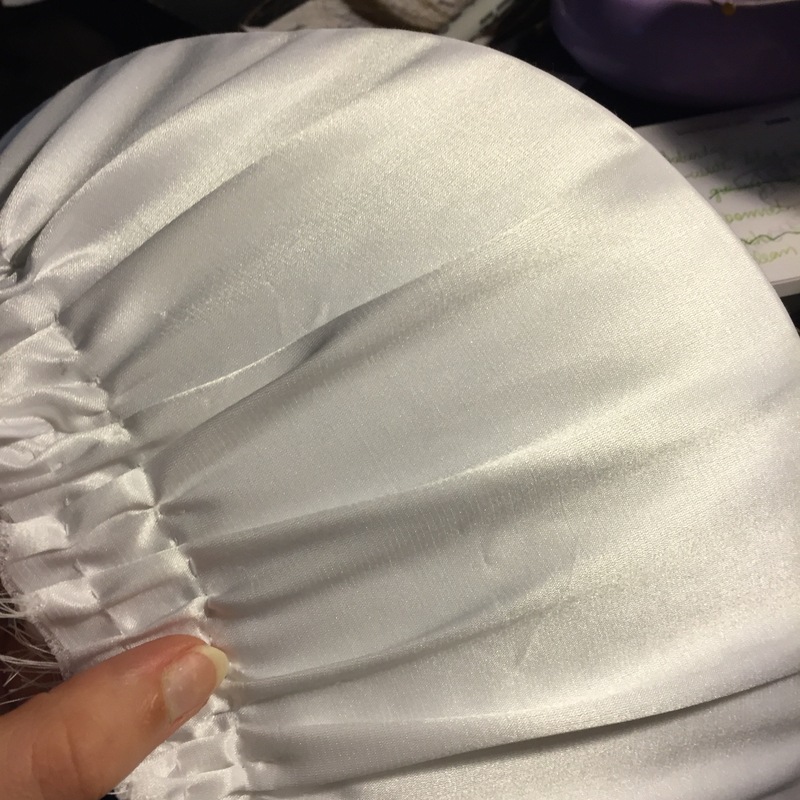 Although the bonnet is finished now, and I do like it, I am considering getting another piece of satin at some point and taking it apart so I can “make it up better” as Lydia Bennet would say. It definitely doesn’t have the amount of ruching I was hoping for at the moment. 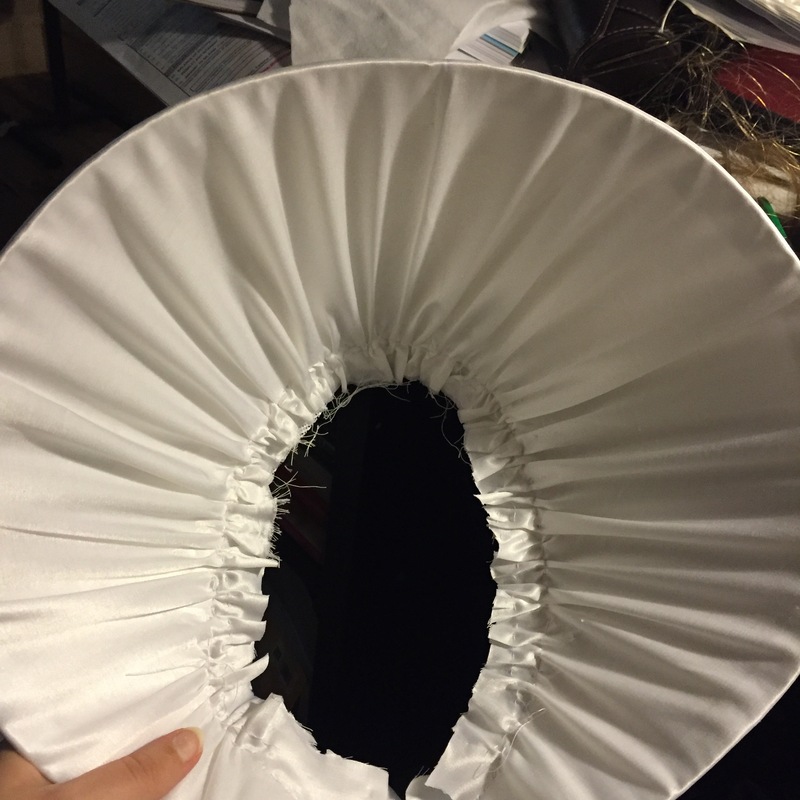 I would normally have wrapped the edge of the satin around the buckram base, but since everything was gathered, I wanted to reduce bulk inside the hat as much as possible, so I just folded it under itself and whip-stitched it to the wired edge of the buckram. Here it is as I was putting it together. 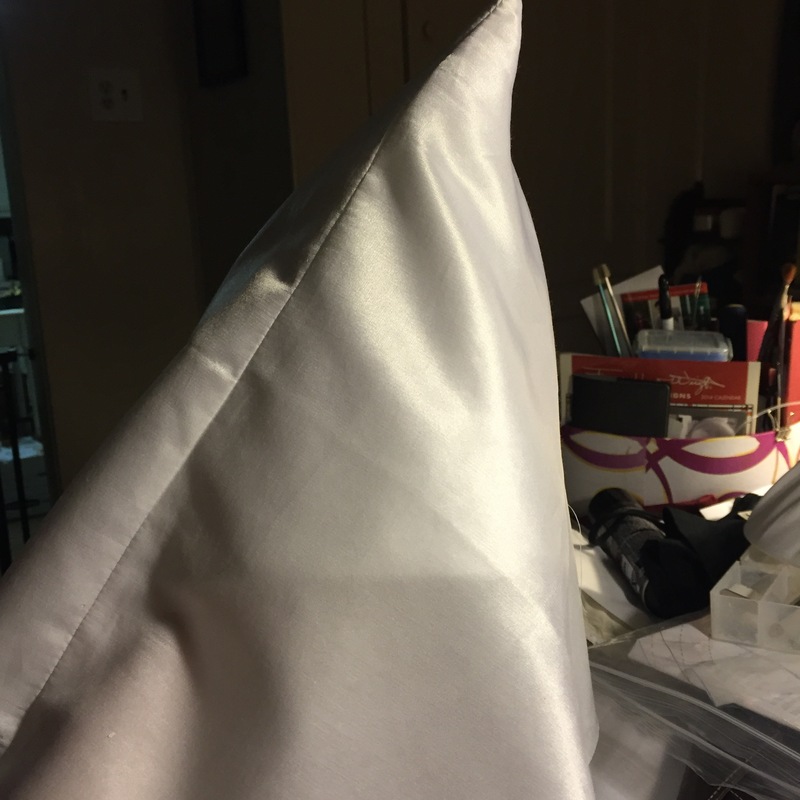 You can see that the satin has very little gathering at the top of the cone, though it will get a bit more of a ruched look when I add the bands around it. The bands and ties are made of silk batiste. 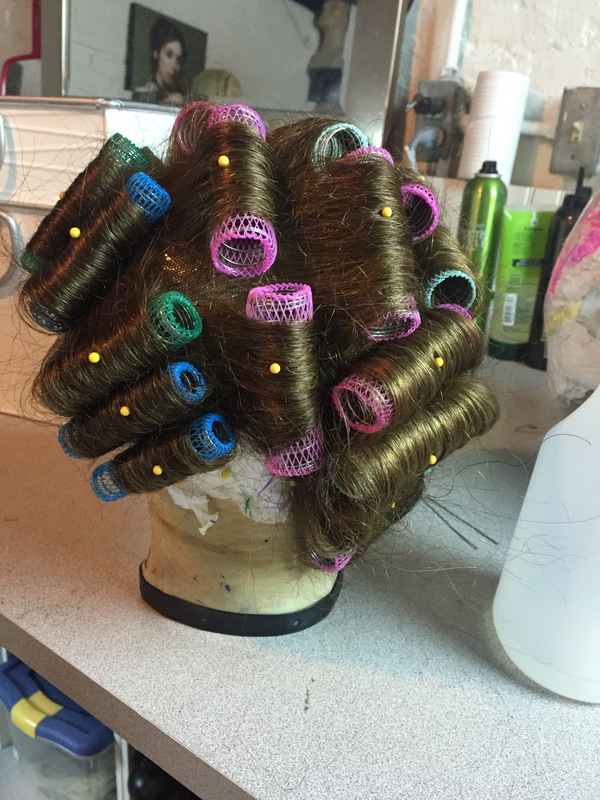 I made the bands by cutting wide strips of the batiste, and folding them in half. 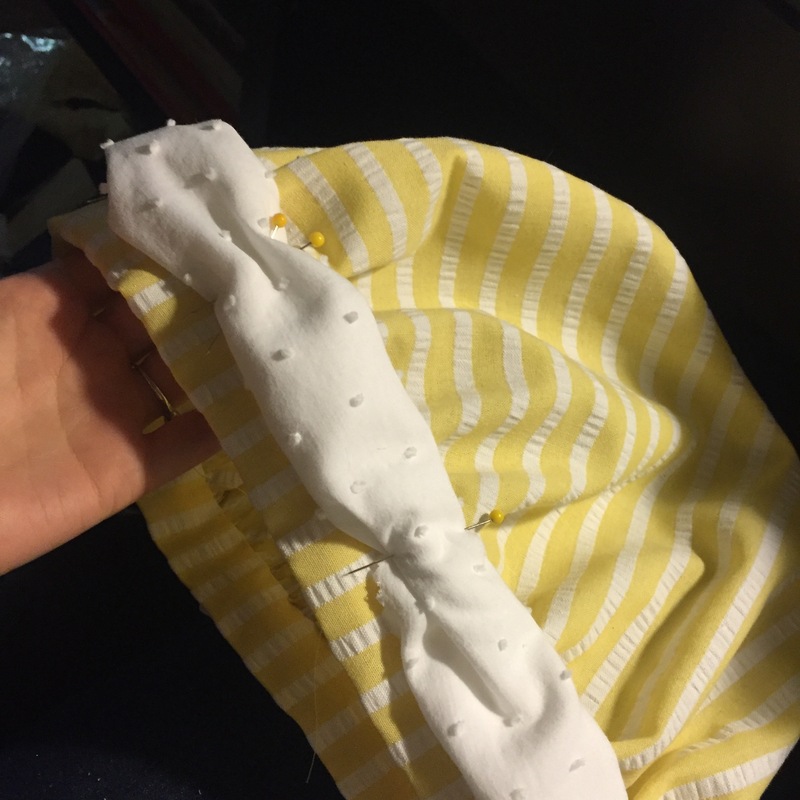 Instead of sewing them into a tube before attaching them, I sewed both edges together as I was sewing them to the bonnet. Then it was just a matter of arranging the band into a pleasing pattern of apparently-random gathers and subtly stitching them in place. 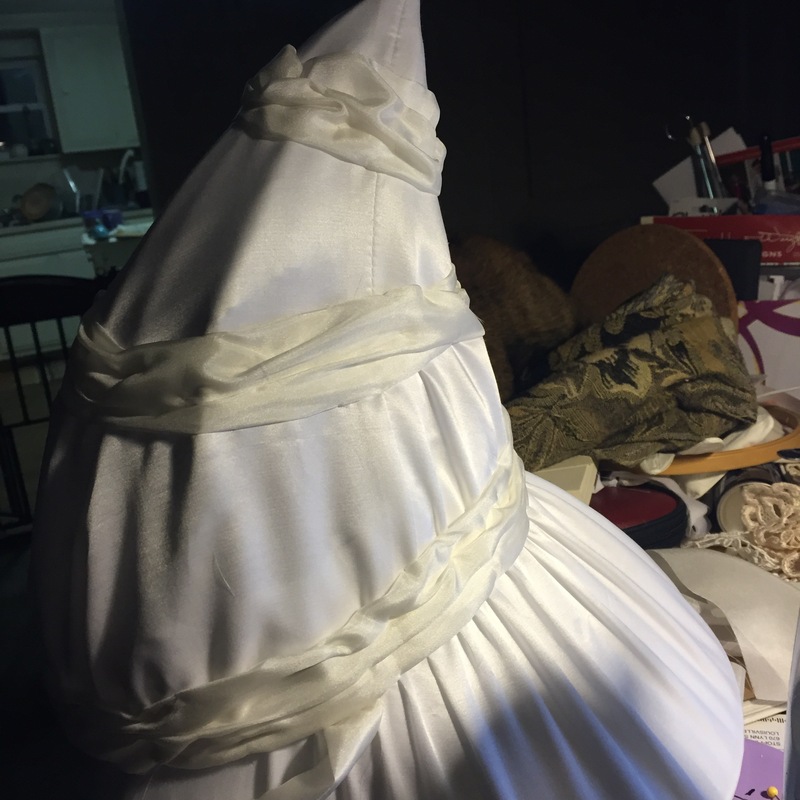 I ran a gathering stitch under where the other two bands were going to go in order to get as much ruching as I could out of not enough fabric. 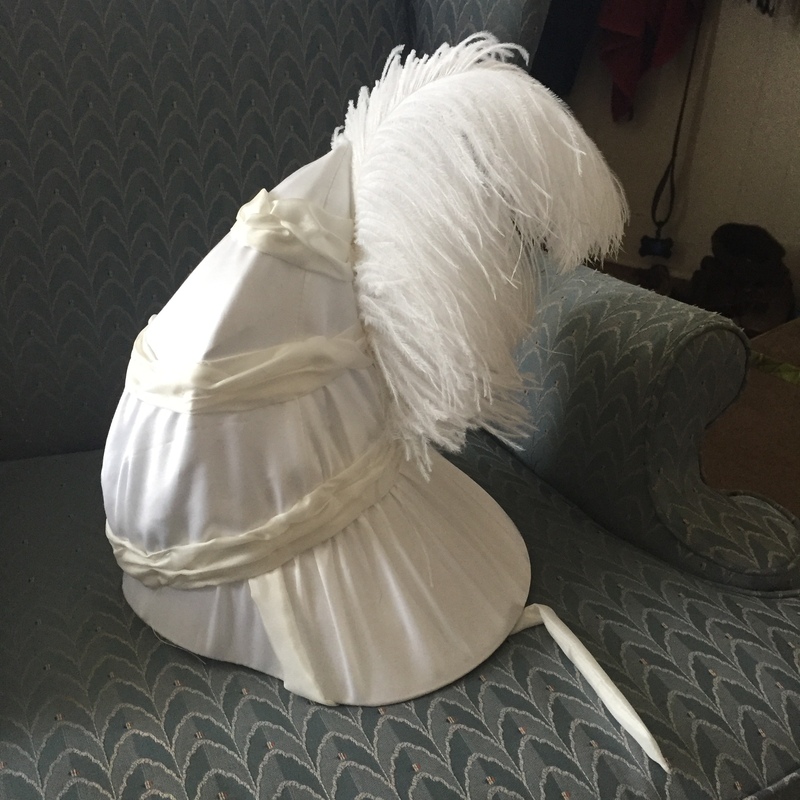 Final step–feathers! I ended up trimming the craziness down around the base of the feathers, then I curled the tips. 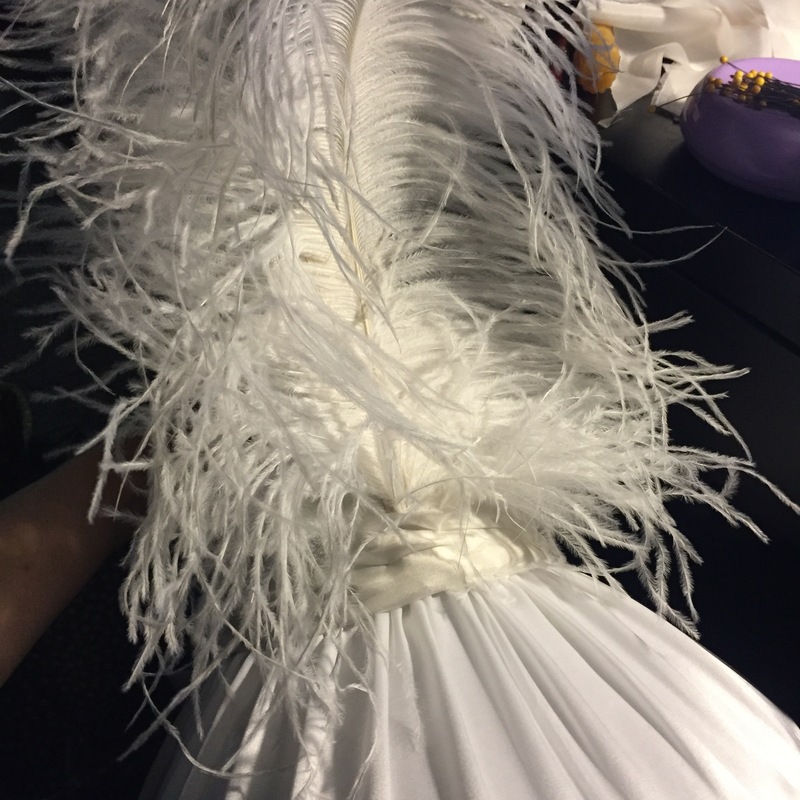 For these feathers, I just used my fingers to carefully bend the feather bit by bit along the top half until they curled up like the ones in the plate. 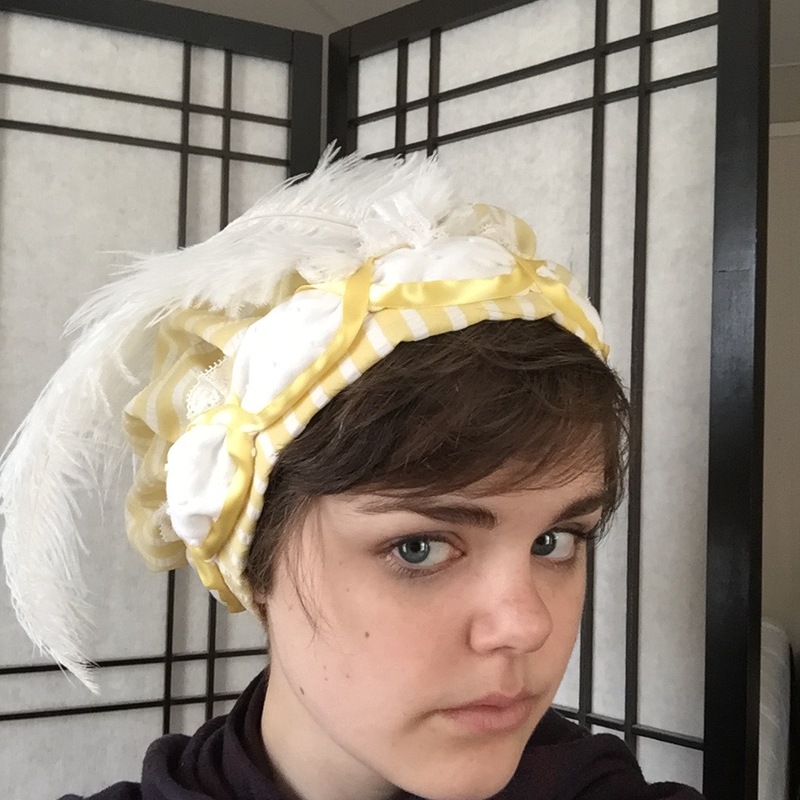 My bonnet has only two enormous feathers, though the plate seems to have three. PS. 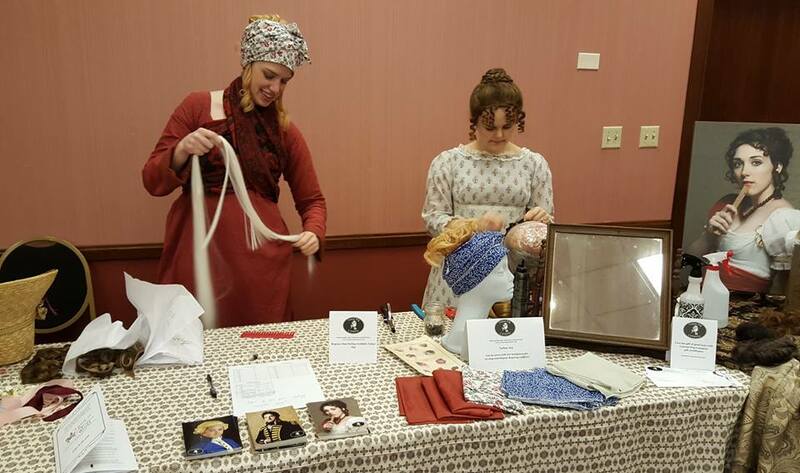 If you enjoy the blog, pretty please like me on Facebook (Fabric & Fiction), or follow me on Instagram (@fabricnfiction)!